Tactical, Practical & Fantastical Reviews & articles for shooting sport enthusiasts. Another January has come and gone, and with it was once again the largest event of its kind in the world… The 2018 Shooting, Hunting and Outdoor Trade Show was held at the Sands Expo and Convention Center from January 23rd through the 26th. Covering nearly 6 hectares (14.8 acres) of flooring, an excess of 2100 exhibitors displayed their products and services for some 60,000 attendees of the 4 day event. 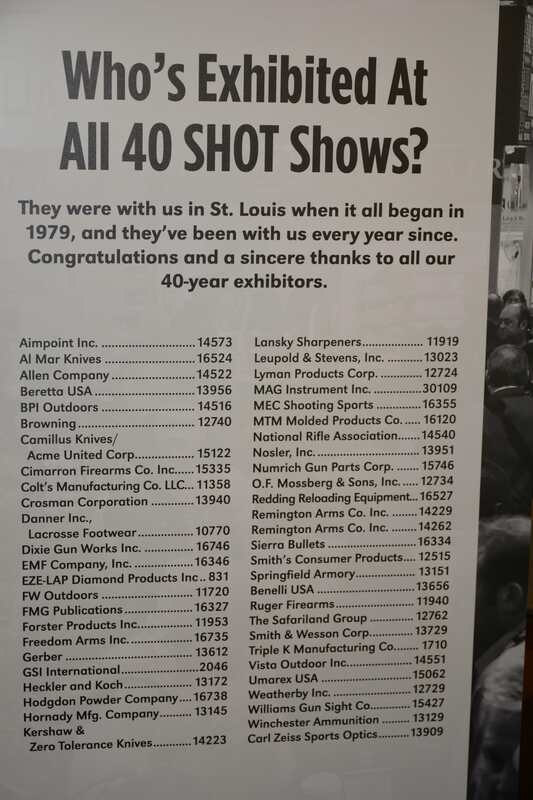 2018 signified the 40th anniversary of the SHOT Show which started way back in 1979 with 290 exhibitors covering a comparatively miniscule 0.48 hectares (1.1 acres). 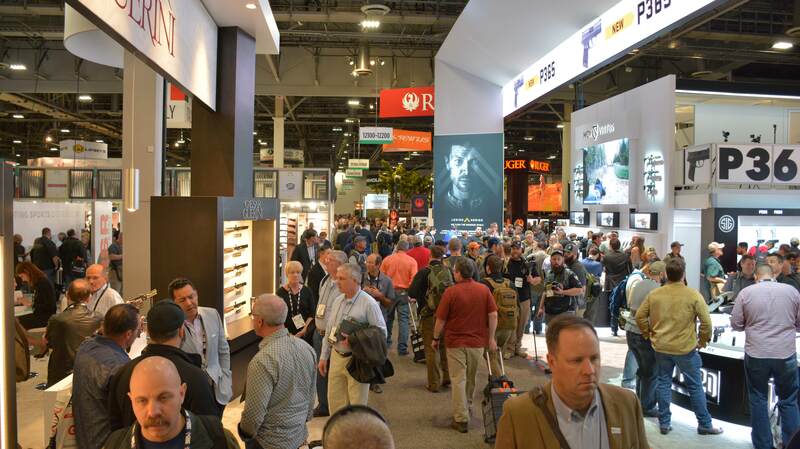 This year’s SHOT Show also marks the 20th time that SHOT has been hosted in Las Vegas, Nevada; and city that is larger than life seems to be a prefect fit for the SHOT Show. Last year saw nearly 3.2 million kg (3,500 tons) of exhibits moved onto the show floor. To put it mildly, the SHOT Show is unbelievably huge. However there is always a catch when it comes to the biggest and best; the SHOT Show is not open to the general public. That is correct, it is only open to members of the industry and trade. 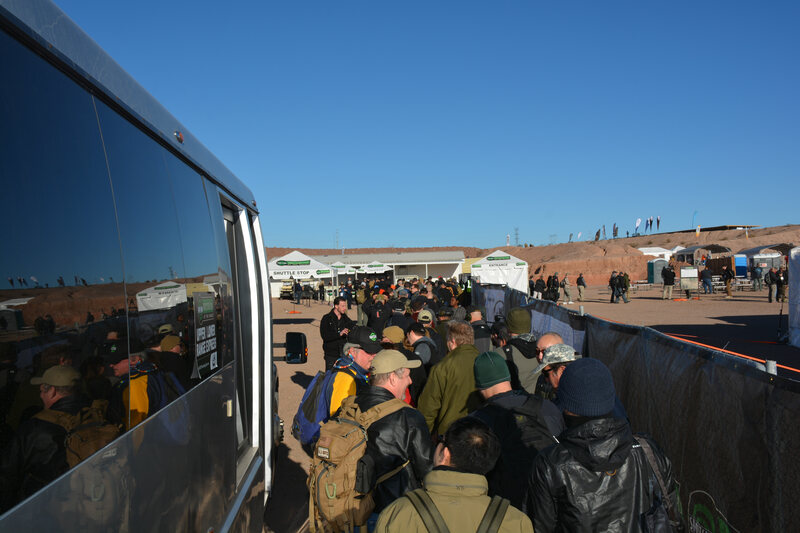 Manufacturers, wholesalers, importers, exporters, retailers, training, non-profit organization and media, all of which are involved in Shooting, Hunting, and Outdoors are able to apply to attend SHOT Show. 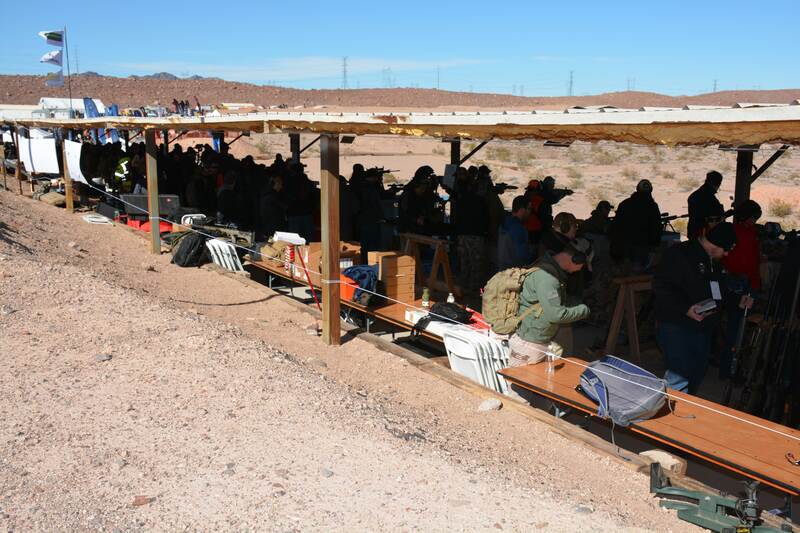 The SHOT Show is preceded by Industry Day at the Range on the Monday before the show. 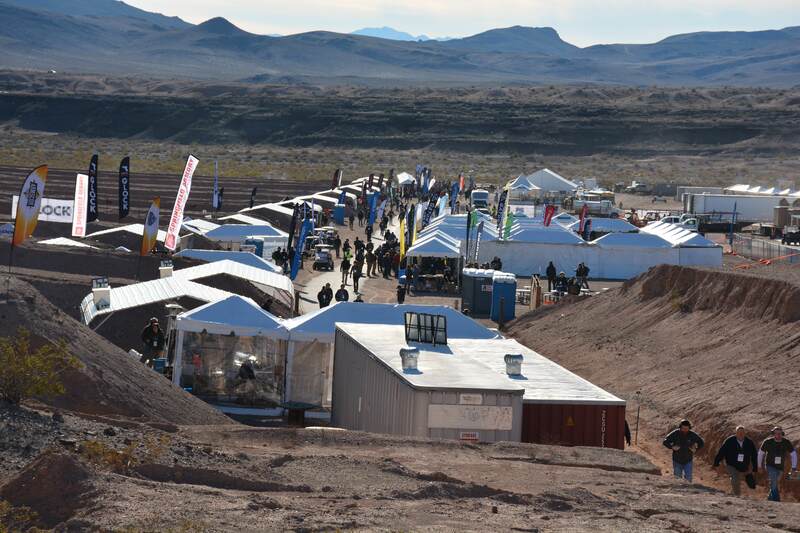 This day allows only exhibitor-invited media and buyers to come out to Boulder City Rifle & Pistol Club and experience first hand the products offered by over 160 companies. 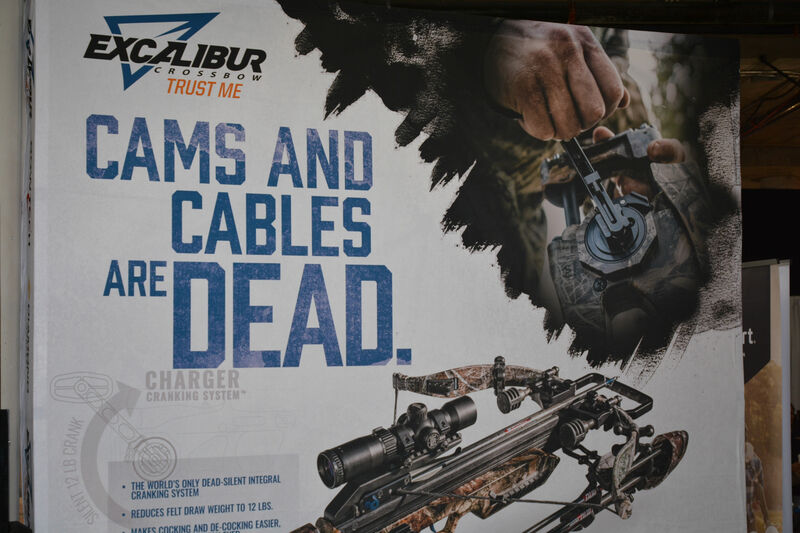 Everything from crossbows to handguns, throwing axes to fully automatic rifles and everything in-between. 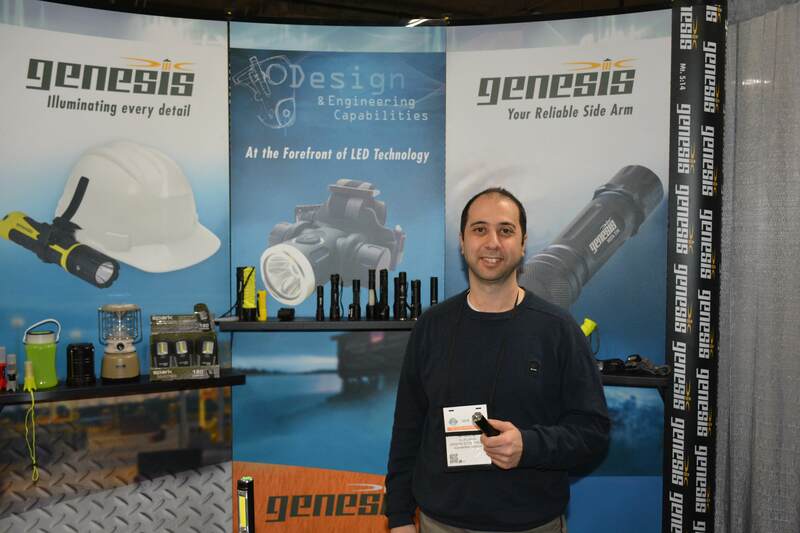 With over 1400 media and 800 buyers potentially being on site during this day, Industry Day continues to be the premier hunting and shooting event in the industry providing hands-on experience for attendees. 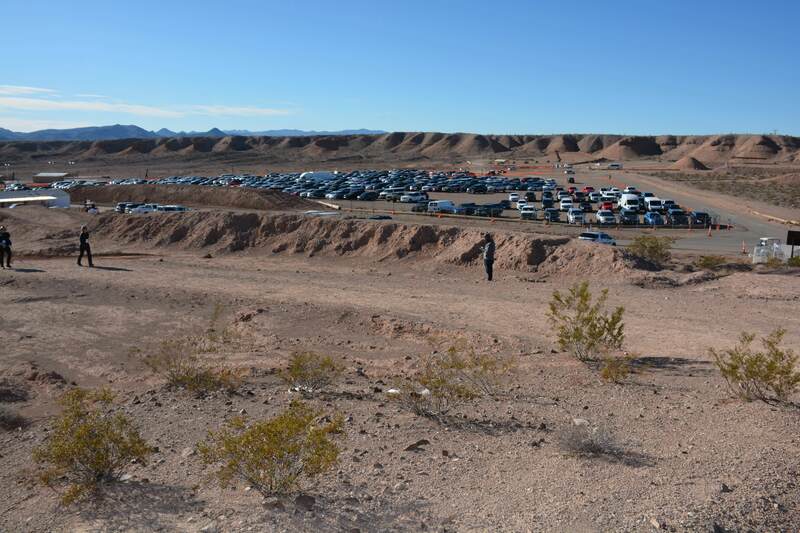 The one caveat is the same as during SHOT Show itself, members of the public are not allowed. 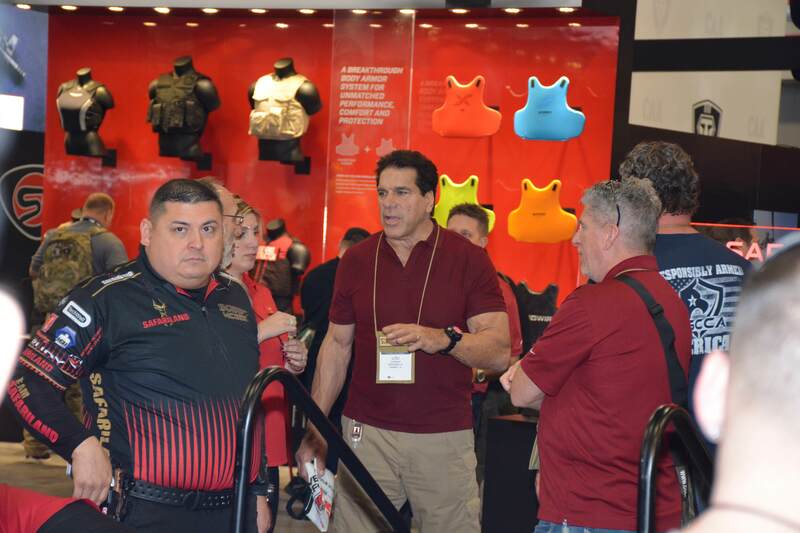 This was the author’s 12th year of attending the SHOT Show and I was accompanied by some long time attendees who had an additional dozen or more shows under their belts. The SHOT Show is now less fun and exciting than it used to be, likely due to the more structured and business oriented planning now done by the author. However, attending the event has always left the author with a sense of awe at the sheer scale of firearms and accessories that are even out there. In perspective; Canada’s outdoor hunting, sporting market brings in roughly $6.5 billion in annual revenue. 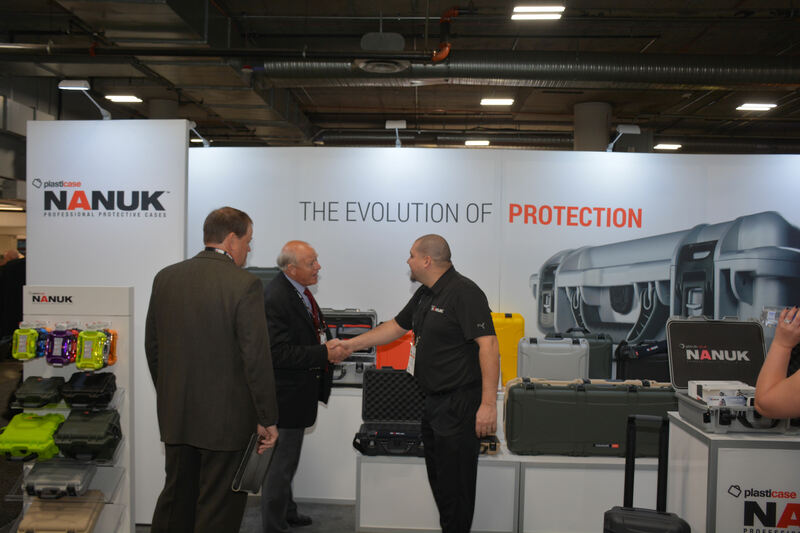 SHOT Show has that value of product and exhibits on display. Damned! IF you thought that the Industry Day at the Range would be the favourite of the author’s annual pilgrimage to SHOT, you would be very close indeed. However, it is the now huge Canadian event that keeps the author coming back every year. 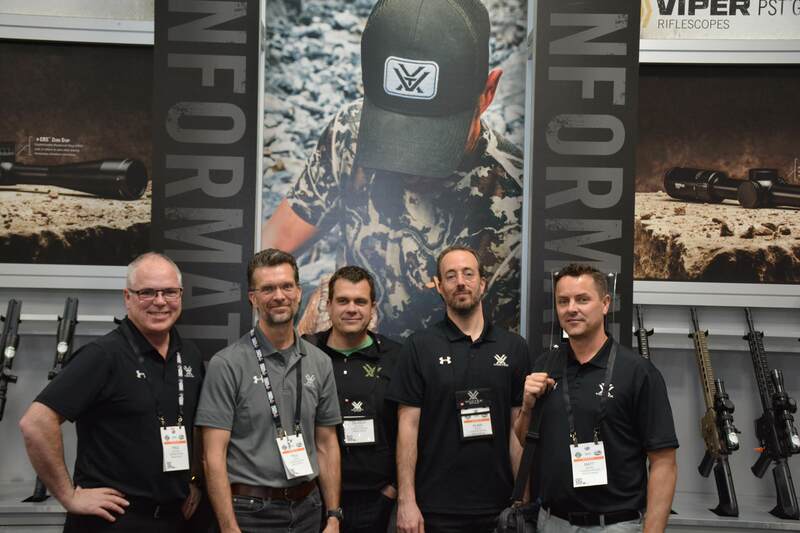 The Canadian Shooting Sports Association (CSSA) once again stepped up and hosted the 5th Annual Canadian SHOT Show Reception, with the support of the Canadian Sporting Arms and Ammunition Association (CSAAA). This event has literally blossomed from a dozen people gathered in a hotel room, to a huge event that draws in Canadians from every aspect of the firearms community. Hosted at the Stratosphere Casino, Hotel & Tower, the event was held towering above the city of Las Vegas 108 stories in the air. 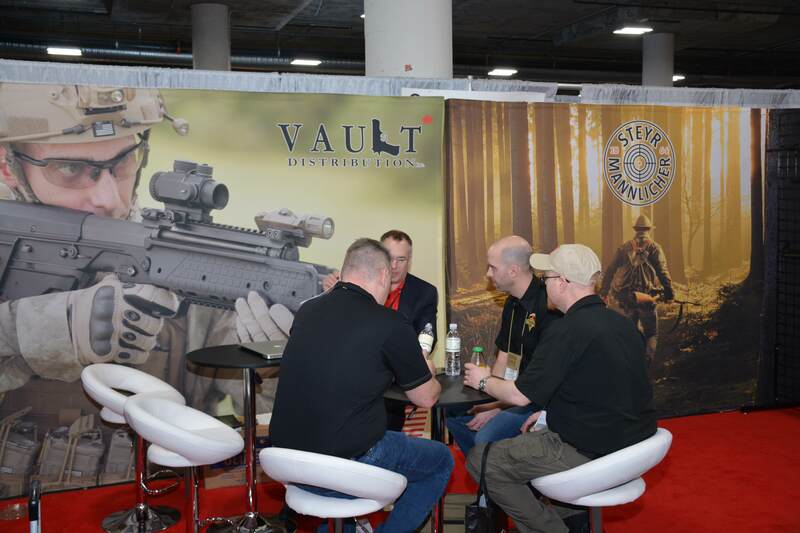 The view was incomparable, the food was great but extremely short-lived, and the casual atmosphere allowed for the Canadian contingent of SHOT Show attendees to unwind a bit and relax and talk to other Canadians about anything including shop talk. This past event hosted in excess of 300 individuals that otherwise rarely, if ever, communicate to each other except through emails and phone calls. However this reception in its current state is only possible through the sponsorship of multiple firearms related businesses and individuals. TPF would like to personally thank each of these for their support and will list each and every one here. Thanks to these sponsors for making the Canadian SHOT Show Reception possible and for being a part of the event. Here at TPF we will be sure to visit each of the sponsors and look at what they have to offer to our Canadian firearms community. We hope that you would do so as well. 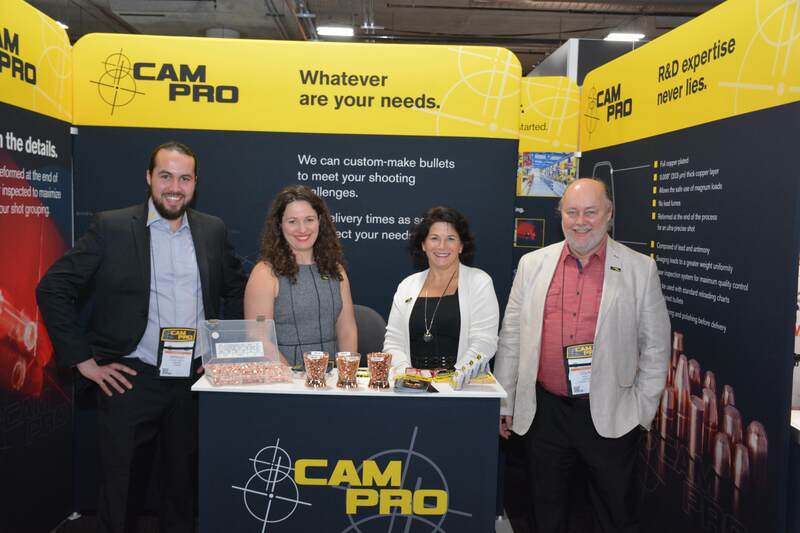 As preparations have already begun for next year’s 41st SHOT Show, which will return to the Sands Expo on January 22-25, 2019; so to have the preparations for the 6th Annual Canadian SHOT Show Reception. Companies and potential attendees are asked to contact CSSA Director Mike Duynhoven. As a FYI to readers who are not Canadian, or are not familiar with our listed organizations; the CSSA is similar to the USA’s National Rifle Association, only more polite eh? They are the organization that represents the firearms consumers across Canada with training, and political outreach; but only have two decades under their belt compared to the NRA’s 150. The CSAAA represents the Canadian firearms industry and looks after their interests, similar to the National Shooting Sports Foundation which organizes and runs the SHOT Show. 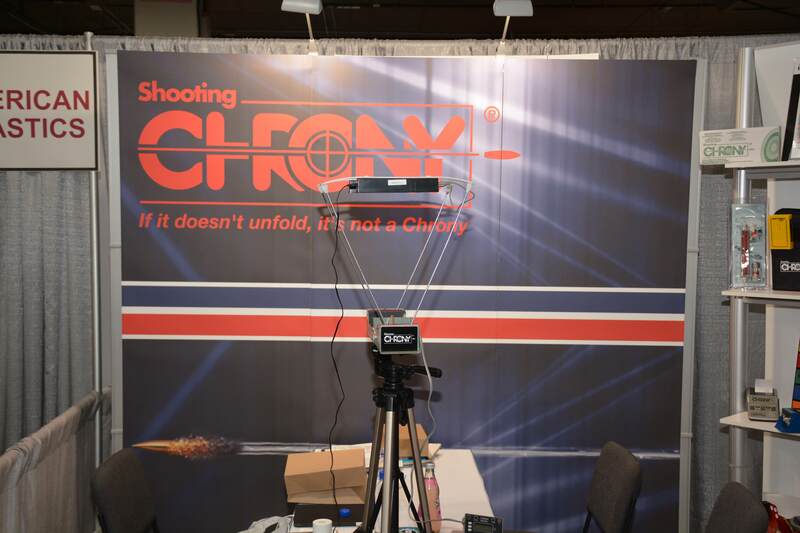 Here is a few images showing some of our Canadian companies that are exhibiting at SHOT Show! Make sure to visit ALL of them and help them all out. 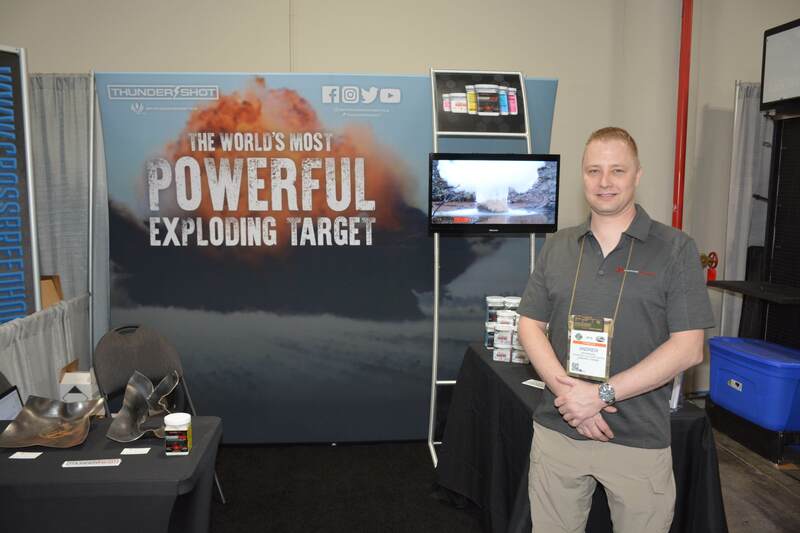 There are currently over 30 Canadian companies that exhibit at SHOT Show with more and more doing so every following year. We at TPF will strive to get you a list and images of every single one of our Canadian exhibitors next year at SHOT Show 2019. 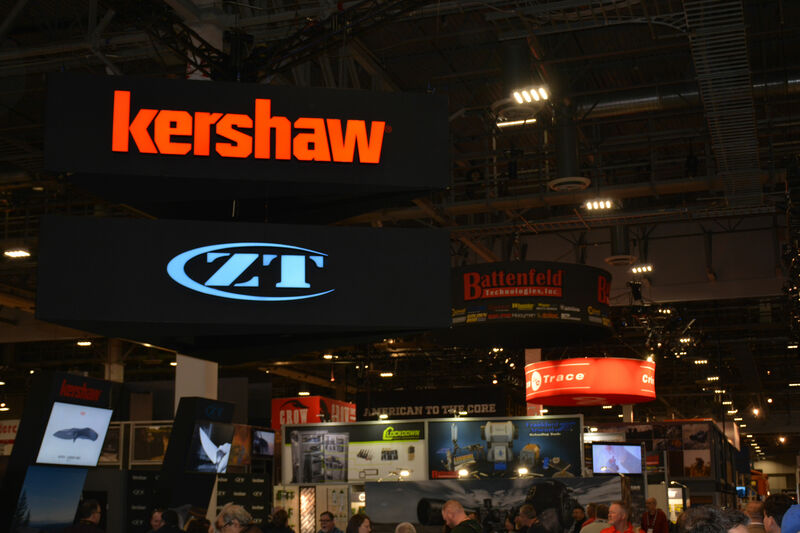 Thank you for reading all the way through this small write-up of the 2018 SHOT Show. We will soon have more reviews and look forwards to future events for 2018. Fun Fact: Canada, while only a tenth of the population of the USA, has a substantial number of legal firearms owners. For every 1000 firearms made in the USA, 95% of those remain in the USA for domestic sales, Canadian markets account for 80-90% of the those exported from the USA. That means out of every 500 firearms exported from US manufacturers, Canadian markets get 400-450 of those. This is the reason that most firearms manufactured have a slightly longer barrel to meet Canadian Restricted status instead of Prohibited, such as Ruger GP-100 is 108mm (4.2″) in length. 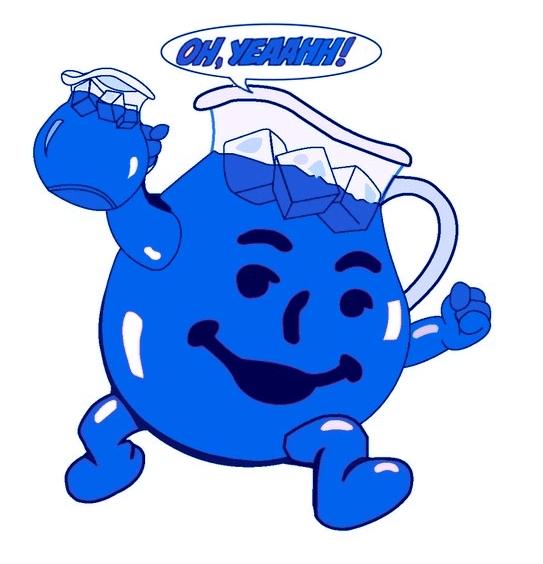 Drinking the Blue Kool-Aid… Is it that Good? In the never ending debate regarding who makes a better reloading press, most are argued by colour. The big three are the green machines of RBCS, Hornady’s red equipment and the focus of this installment of TPF, the blue of Dillon Precision. Do not let the title fool you as it is a reference to the detractors as well as the supporters of Dillon products, who would be adamant that you, “Do or do not drink the blue Kool-Aid.” Aka, using Dillon’s presses. 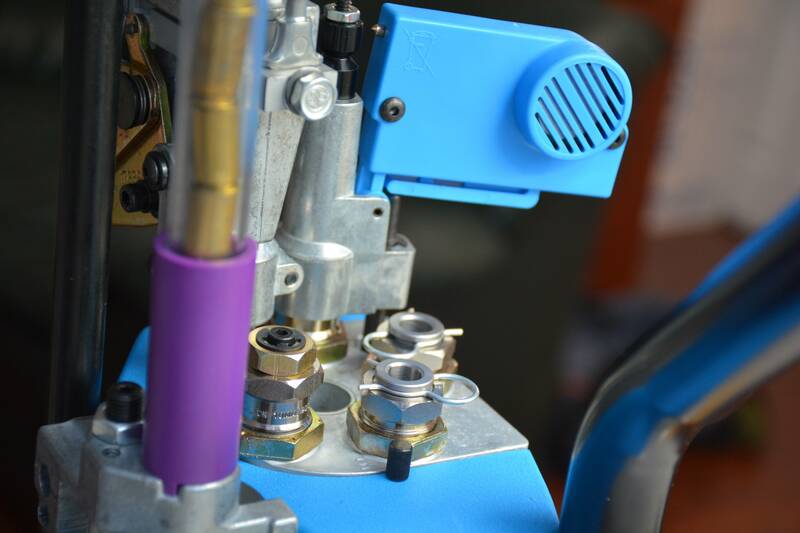 As the title and opening lines suggest, Dillon Precision Products are normally painted in a blue colour which sets them as a recognizable alternative to the other press manufacturers. TPF has had some experience with progressive presses from other manufacturers, and has loaded several tens of thousands of rounds on single stage presses, to turret presses, to progressive presses. This would be our first foray into “Blue”. We selected a Dillon XL650 progressive press, as it is considered to be the staple flagship of the Dillon progressive press line. We also decided initially to use .40 S&W as the loading calibre as it is the “bastardized” calibre that usually incorporates parts from both a 9mm and a .45ACP setup, and causes the most headaches for reloaders. 1 primer system with large and small priming parts (appropriate size installed). 1 large and one small primer pick-up tube. 1 powder measure with standard large and small powder bars (small bar installed). This time around we are going to change it up a bit and go right to the cons of the Dillon XL650. The reasoning is simple, the two biggest negatives that are outstanding are very important ones that would prevent someone from purchasing this press. We at TPF can sense the pro-Dillon group gnashing their teeth and cursing us for stating this right up front, but please bear with us. These reasons would prevent someone from being able to utilize a Dillon XL650 period, regardless if they wanted one, it is that important to understand. The first thing that anyone needs to realize is that the Dillon is a large, tall press which towers roughly 81cm (32″) above the mounting surface. That is without the case feeder system feeding/mounting requirements and the optional strong mount component, which add in 16cm (6.5″) and 21cm (8.5″) respectively and with clearance requirements . Most benches and tables are 0.9m (36″) high, when you add in the additional 1.2m (47″) including assembly/disassembly clearance, you are just a 9mm case short of 2.1m (84″). For many basements in older homes this is a very tall press indeed. especially with ductwork and other stuff which can severely limit ceiling height. However as tested without the strong mount option, this XL650 measured 89cm(35″) above the mounting surface and TPF had no issues at the review location. If you wanted a fully kitted-out Dillon machine with two (2) complete calibres such as 9mm and .45 ACP, your total would be in excess of $1650 USD. That is some serious expenditure for the majority of casual firearms owners. If you are wanting Magnum rifle and exotic calibres, the prices are even higher for those component parts. Space claim, and cost. These are the TWO major obstacles that need to be overcome before acquiring a Dillon XL650 progressive press. That is it. So if you have the ability to fit and afford the Dillon please keep reading on. While there are a few little quirks and stickling points regarding the press and its usage, they are not reasons for avoiding the Dillon. Looking at the initial design and the quality, fit and finish of the press when assembled, it is nearly flawless. 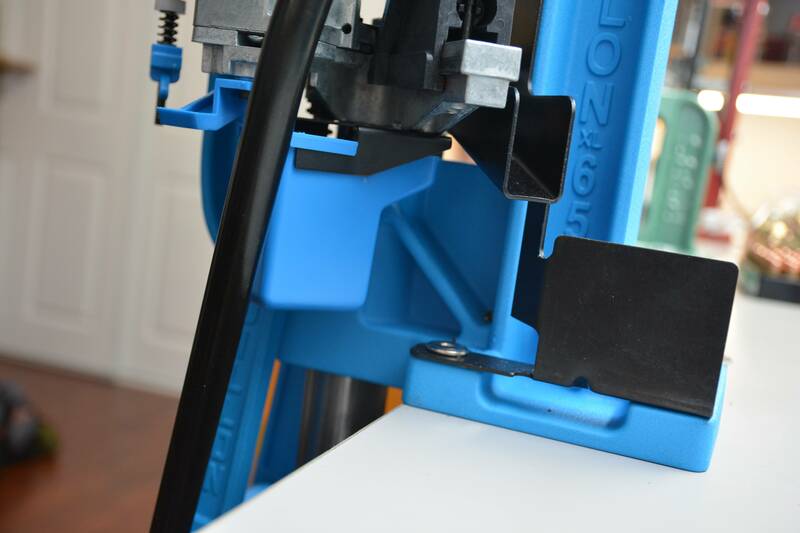 The main press frame components are cast clean with no flash and a beautiful, even powder coated blue finish. The alloy cast parts are neat and clean as well with minimal parting lines displayed and no burrs or sharp edges anywhere that can be touched. Machined portions are excellent with good surface finished and minimal tooling marks visible. The entire design uses hex head bolts, or hex head cap screws when threaded components are required, the remainder is attached and assembled with E-Clips and various snap rings. A very well engineered design, with good hardware control. Items which are not powder coated, or aluminum are plated to minimize corrosion, which is another added plus. Which brings us to another item. Dillon’s “No BS Warranty!” Every single option and add-on is as well made as the press assembly itself and Dillon stands behind it’s mechanical components for life. Yes for life. You have something break, bend, or otherwise get mauled? Call Dillon, get it replaced. The instruction/installation manual is extensive and includes all Dillon options for mounting and installation. Loaded with visual images and clear precise methods, the manual includes full part lists and detailed component breakdowns. Bolting and mounting is as simple as can be expected for a progressive press. Set-up of the press is clear and pretty much straight forward thank to the illustrative and comprehensive instruction manual. The manual progresses through the setup of any calibre in an orderly fashion, starting with the re-sizing and decapping, moving on to the primer feed system and powder measure and finally with the seating and crimping portion of the press. 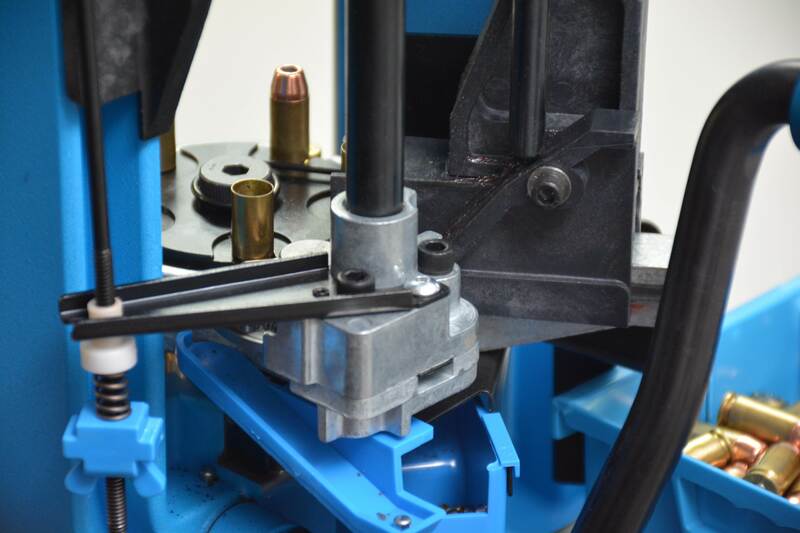 The usage of retaining pins for case keeping at the five (5) indexed positions are very accessible and allow for a simple method of removing/reinserting cases in the middle of the reloading process. A very simple and smart idea. The finished bullet chute works extremely well at delivering the completed round to whatever size of tray you wish to use for the final catch basin. The slider bar powder system is a tried and true design that has been used for many decades in powder dispensing systems. 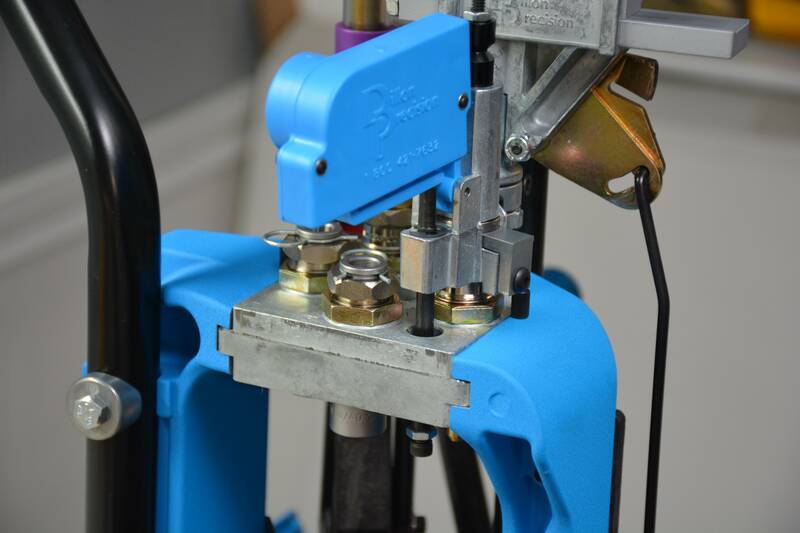 In the case of the Dillon, the bar has an adjustable orifice which allows for the volumetric control of powder to be dispensed on each operation. 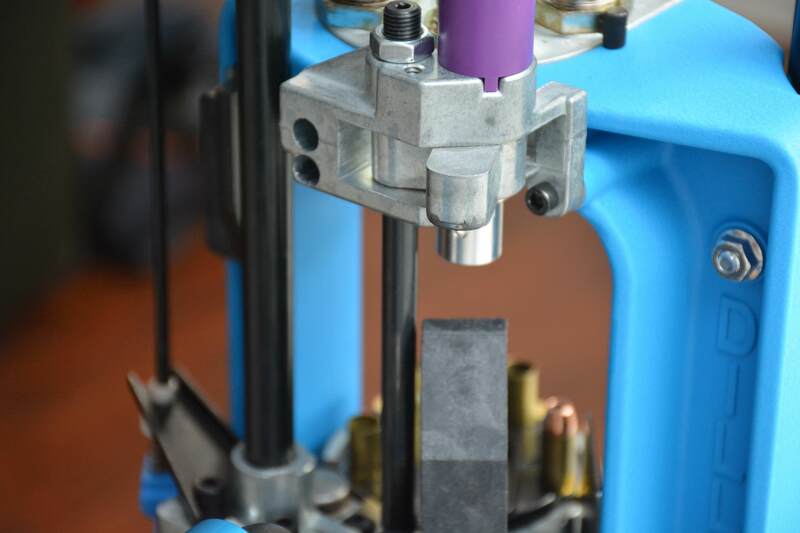 With this come the first little quirk as setting your desired volume of powder is a very touchy operation due to the simple hex head bolt system. There are numerous aftermarket components or replacements to this adjustment bolt that allow for a finer control over the orifice size. That being said; once the system is setup, it stays consistent and never shifted during our testing. 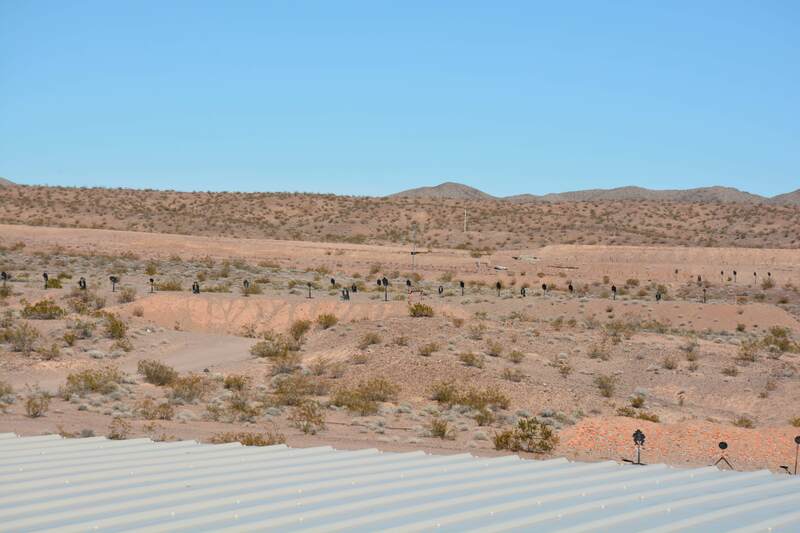 With the system setup, TPF churned out over one thousand rounds of ammo in a little under three (3) hours. Please remember that this was our initial setup and test run of this press and we observed all aspects of the press to determine the function and traits of the press. Our biggest bottleneck in reloading? Filling primer tubes. 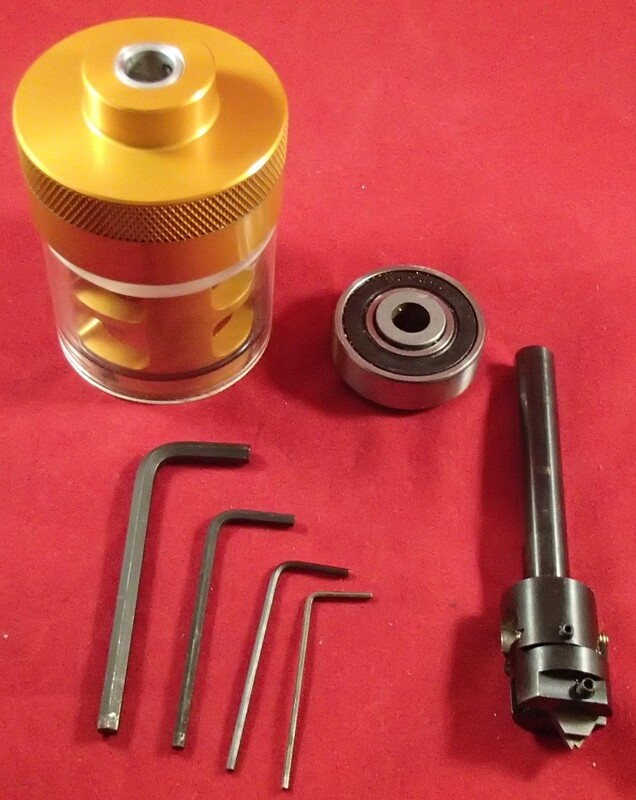 Once we had gotten the system all setup TPF decided to try the quick change aspect of the system and acquired a Calibre Conversion kit, dies, toolhead, etc… for 9mm. Here is where the strength of the Dillon truly shines with the ease of swapping full calibre arrangements back and forth, in under 15 minutes with pre-set toolheads. The new tool head had the powder measure, dies already setup and locked in place, with the only requirements being to remove a few set screws, change the brass plate holder and the pins and VIOLA! The press is ready to go, only for a different calibre. Except for the bending of an Allen-key trying to remove a very secure factory installed insert, the changeover worked very well. We are assuming that this issue will not give us any issues in the future as anti-seize compound was added to the offending thread during the calibre conversion. As long as the primer size remains the same, this is an extremely easy method for swapping calibres. 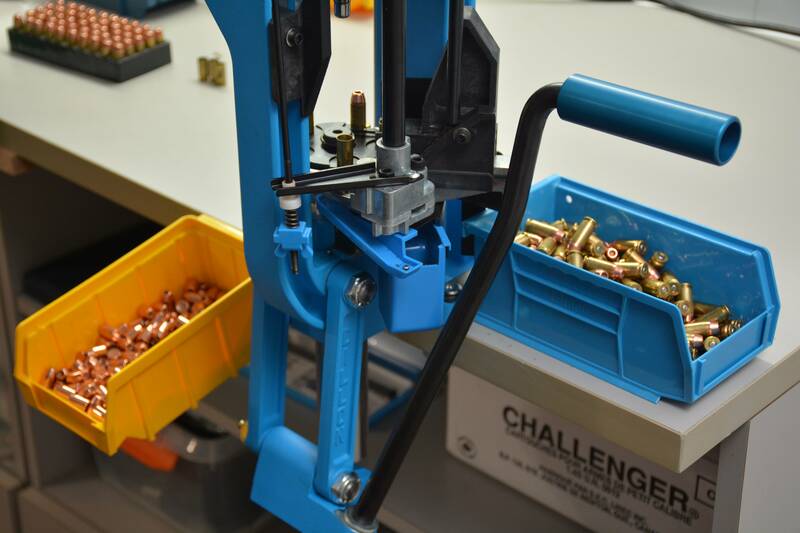 With the new 9mm setup, we quickly produced in excess of 1500 completed rounds of ammunition. By quickly we should mention that it was in the same timeframe as previously, three (3) hours. The primer system…. This is the only truly detraction that the XL650 has regarding it’s operation. 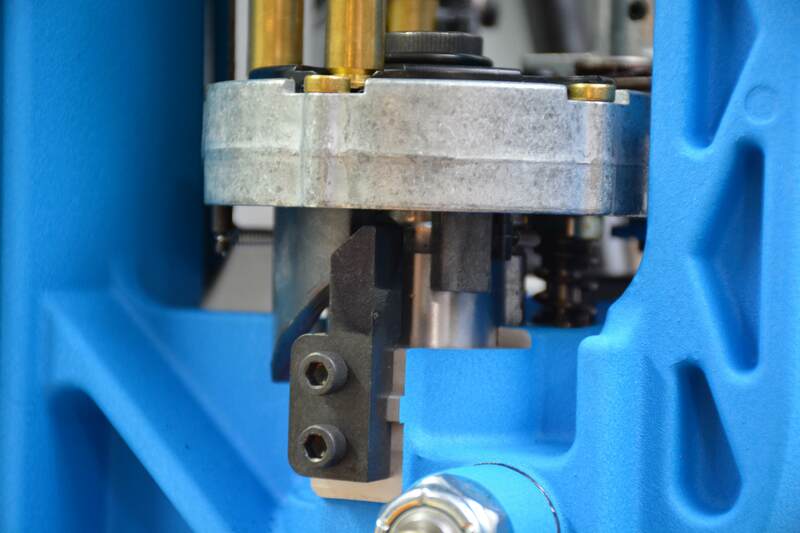 Primers are ejected from the De-Capping die into a small removable tray and occasionally the primers will bounce out of the tray and onto the floor, regardless on the manufacture and design of the de-capping pin. So keep a broom handy and watch your step if you hear the primers fall out and empty your spent primer collection tray on a regular basis. The real issue is when installing new primers into cases. 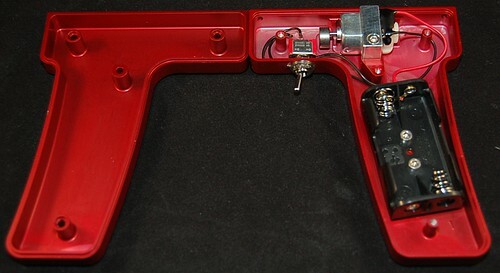 Specifically if there is no case to install a primer into… The primer feed system is a positive indexing system so it feeds a new primer with every pull of the handle and if it doesn’t use the primer, well… When the primer loading system cycles and fails to install a primer into a case due to the absences of the case, that primer continues on it’s way around in the primer carousel until it gets dropped. This occurs before the next primer tries to take up the same space. That unused primer then takes a trip off what is known as the Dillon Ski-Ramp. TPF installed the 9mm conversion kit and then heard something hitting the wall with nearly every press for a couple pulls of the handle. Turns out to have been live primers launching themselves off a small sloped path located at the front underside of the main ram platform. This shallow, low ridged ramp, actually managed to stop 1 in 5 live primers during our setup of the 9mm, so if you are doing any setup, do it with an empty primer system. Roller Handle – Very well made, and more comfortable to use that the original handle, but not a requirement for an efficient XL650 setup. Powder Check – An excellent and simple design. Easy to use and to move from one calibre set-up to another. A good addition. Case Feeder – The unit itself is quiet, very quiet. The low and high speed options are excellent and the steel guide panel is an excellent choice to adjust for the feed wheel edge. Be aware that these case feeders are not meant to hold more than a couple hundred cases at a time due to mass, the motor/clutch can be overloaded. A necessity for any volume reloading. 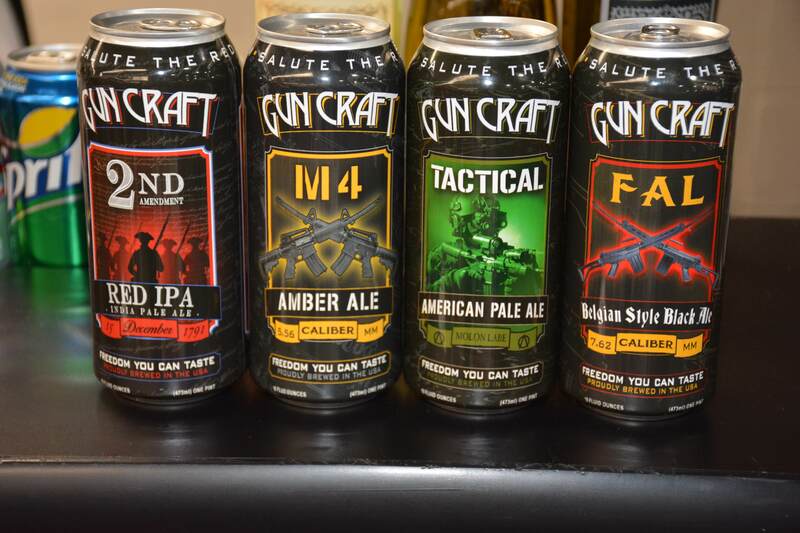 These last couple items are more of a general commentary on what Dillon can du to improve their product, or at least include to make their customers even more satisfied. 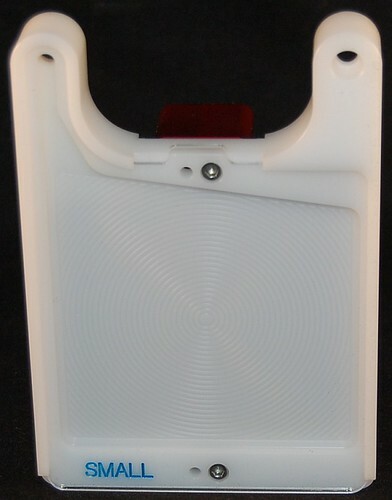 Primer de-cap tray and the ‘Ski Jump’ – add in a small piece of foam in the de-capped collection tray or increase it’s depth to prevent bounce outs. Change the design of the ski-ramp to have larger walls or into a removable barrier that stops unused primers from launching across the room. There are already aftermarket option out here for this. A small tube of lubrication- The greased ramps work well, if a bit messy as if you need to adjust you will come into contact with at least one of these sliding surfaces. That way Dillon can indicate what types of grease to you and frequency of re-application. The ratchet system – Another company builds a bearing drop-in system that makes the ratchet action as smooth as silk. Mounting hardware – It’s $1 worth of bolts, washers, and nuts. Include it with the basic set. We have drank the Blue Kool-Aid and have found it a very satisfying… Expensive and not perfect, but a very capable machine for those reloaders who want to maximize their rate of loading with the ability to have multi-calibre stations available to change on a whim. For the shooter who only reloads for one single calibre, there may be other brands which will preform the same for a more affordable price point. However! if you load for two or more (2+) calibres and value your time for setting up a press and appreciate the convenience of fully setup, easily swappable calibre conversions, the Dillon XL650 may be indeed the best flavour of kool-aid for you! 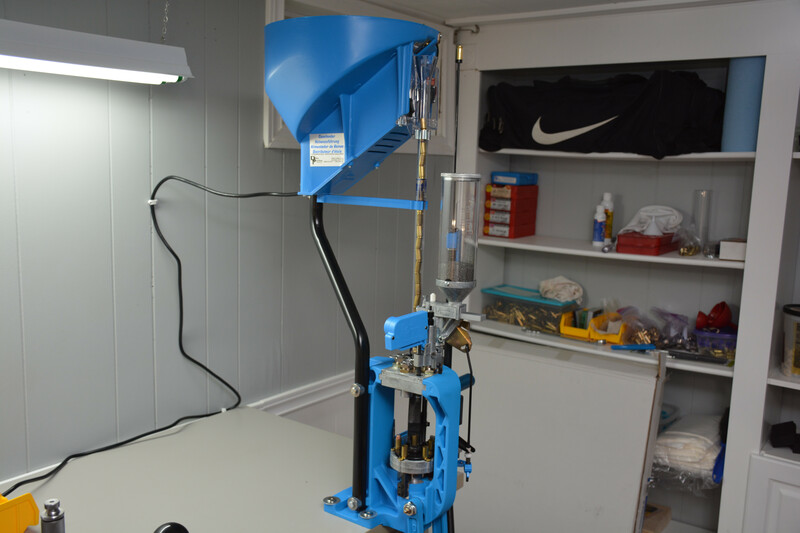 With a base MSRP of $589.95 USD, Dillon Precision’s XL650 reloading press is a solid addition to a reloader’s repertoire of equipment, albeit not inexpensive. Dillon Precision products are available online as well as at physical stores such as the Montreal Firearms Recreation Centre (CRAFM), in Lachine, Quebec. As always, to readers of TPF, the final decision of this product is up to you. Do you think that it falls under the category of Tactical, Practical, or Fantastical? Warning: This is a LONG entry, with numerous images. The week of January 16th once again saw the Sands Convention Centre in Las Vegas, Nevada; host the the 39th annual Sporting, Hunting and Outdoor Trade Show; also known as the SHOT Show. For those who do not know what SHOT Show is or what it consists of, TPF will give you a quote direct from the National Shooting Sports Foundation (NSSF) whom organizes the event. 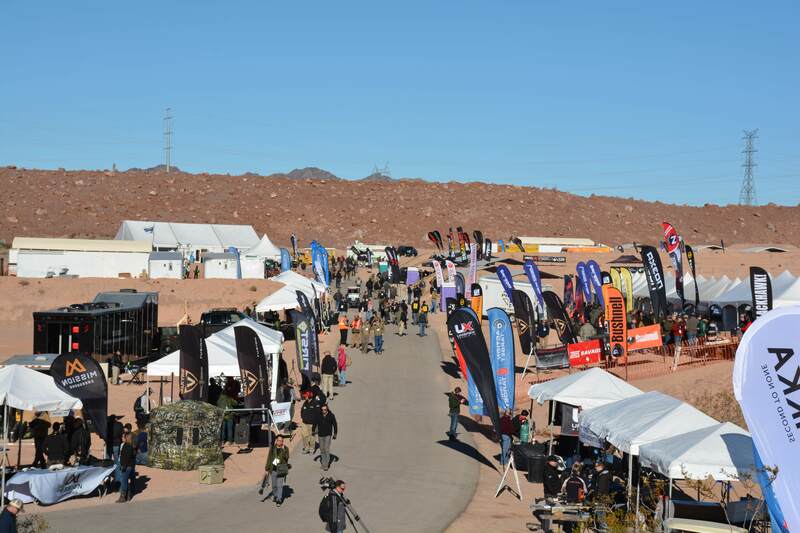 The 39th Shooting, Hunting and Outdoor Trade Show opened its doors this morning at the Sands Expo Center with industry expectations running high in response to the energized market in America for firearms, ammunition and accessories. 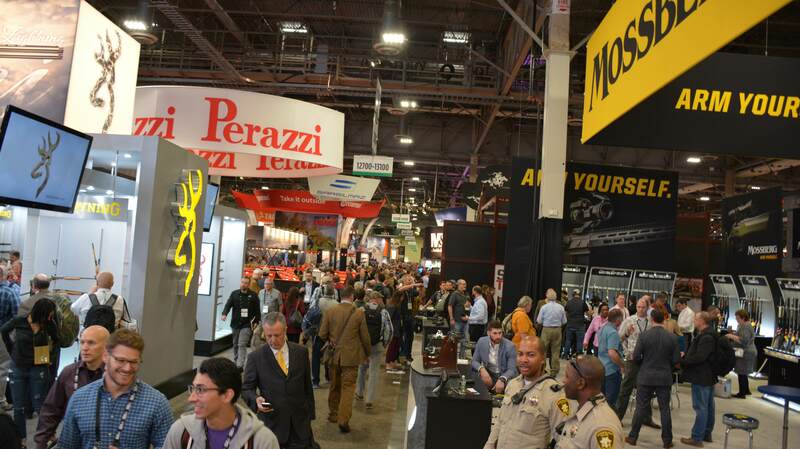 Over the next four days, the show will attract nearly 65,000 industry professionals from the firearms and outdoor industry, including 2,500 members of the outdoor press-the largest gathering of outdoor media in the world-and showcase new, innovative products used for target shooting, hunting, outdoor recreation and law enforcement purposes. Owned and sponsored by the National Shooting Sports Foundation, the trade association for the firearms, ammunition, hunting and shooting sports industry, the SHOT Show is the largest trade show of its kind in the world. 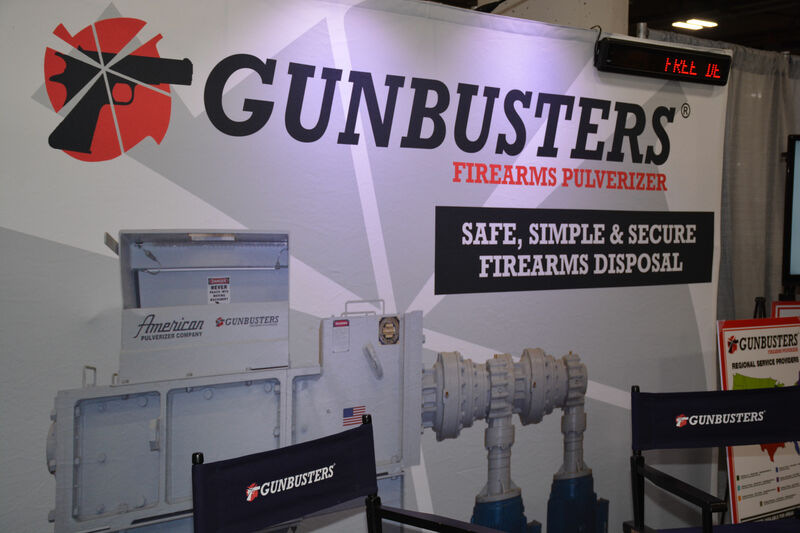 The show is open to trade members only and not to the public; consumers will see the products unveiled at the SHOT Show on retailers’ shelves during the course of the year. You read that correctly, not open to members of the public. We at TPF can already hear our readers rolling their eyes and thinking to themselves, “But we are the consumers!” Which is true, except that the consumers that are mentioned the service companies and persons who are directly related to the industry. Not the end user, otherwise known as the public, but those whom supply the products to the end users such as retailers, trainers, ranges, organizations, etc… That being said, there are ways that the public can attend, and do attend as is evident to many who have attended SHOT know. TPF-Online will not go into details or methods for the public to get into SHOT Show. We apologize, and suggest that you utilize your favourite search engine or firearms forum (for Canadians, we recommend Gun Owners of Canada or Canadian Gun Nutz). 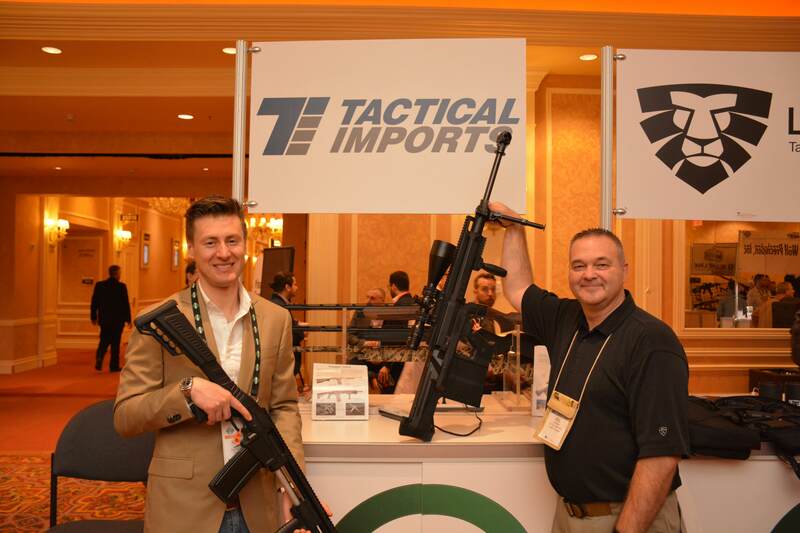 So let us delve into the timeline of SHOT Show. Is this the cure that prevents countless hours of suffering? “The cure to what?”, may be the first question popping into the thoughts of TPF’s readers. In this case, it is the cure to the single most complained about, biggest headache for anyone who reloads rifle cartridges. Besides the tedious task of collecting range brass and cleaning it through various means, there are many steps to preparing a spent rifle case before ever assembling a new cartridge for use. Collect spent cases: Go pick up your brass and if you are lucky, everyone elses! Clean cases: Degree of cleanliness is dependant on the reloader themselves. Wipe off, dry or wet tumble, ultrasonic cleaning? Size cases: Full or neck only sizing is another factor dependant on the reloader’s desires. Trimming brass: Cutting to length and possibly chamfering inside and outside of the case neck. Powder charge: Check the type of powder, as well as the levels in the hopper/scoop. Also do not under or over charge the case! Bullet seating: Make sure your OAL allows proper feeding! 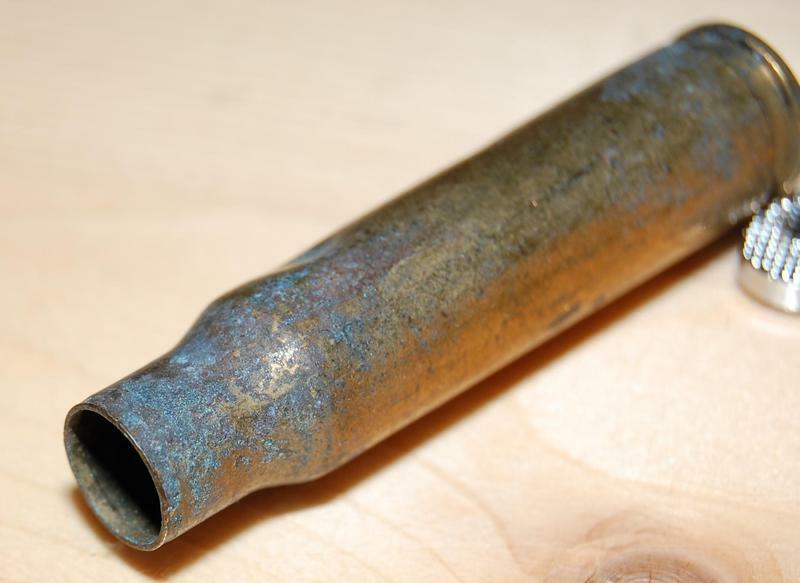 Bullet crimping: If necessary and do not over crimp! Trimming is the simple procedure in cases preparation that involves the shaving of brass down to specifications for most calibres as set out by Sporting Arms and Ammunition Manufacturers’ Institute, aka SAAMI. IF you perform step number 5, there are a huge number of methods available for an equally broad range of retail pricing. However the product on today’s TPF plate for reviewing is the Trim-It II. Machined from 6061-T6 Aluminum. This baby is built to last. 100% Forever (plus 90 days) Guarantee. Made entirely in the good ole’ US of A! 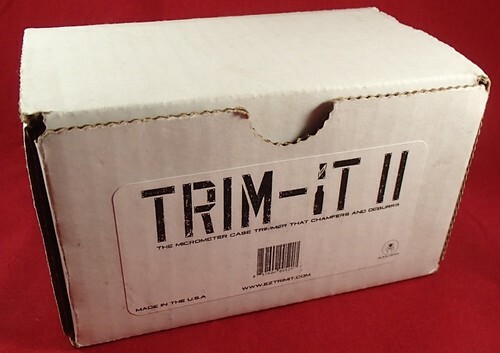 The Trim-It II that TPF obtained came is a small, compact cardboard package which contained everything needed to start trimming. OK. 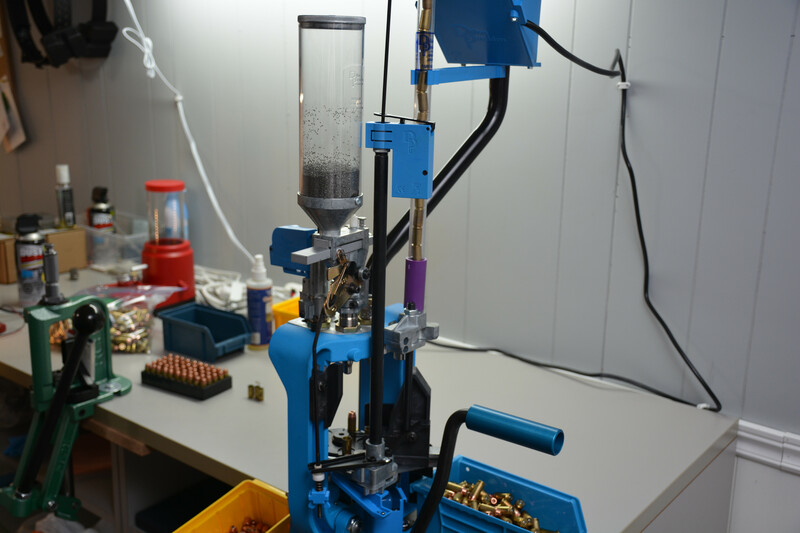 Almost everything… Like most reloading apparatuses, the basic unit does not come with the calibre specific components such as sizing dies and the like. This product is no different, and offers calibre specific bearing dies for many of the most common hunting calibres, pistol calibres, and some of the more popular long range benchrest calibres that are used. The original Trim-It had a micrometer adjustable depth ability and a four bladed flush cutting head that did just that, trimmed cases to the user’s set length. The secret to both the Trim-It and the Trim-It II? The calibre bearing die. 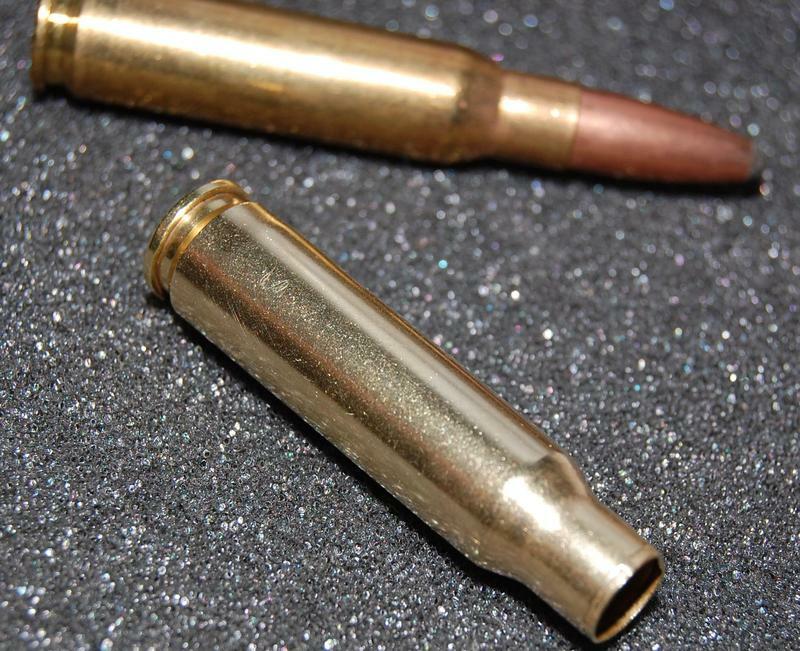 For this review, TPF-Online decided to use the ever popular .308 Winchester round for trimming. 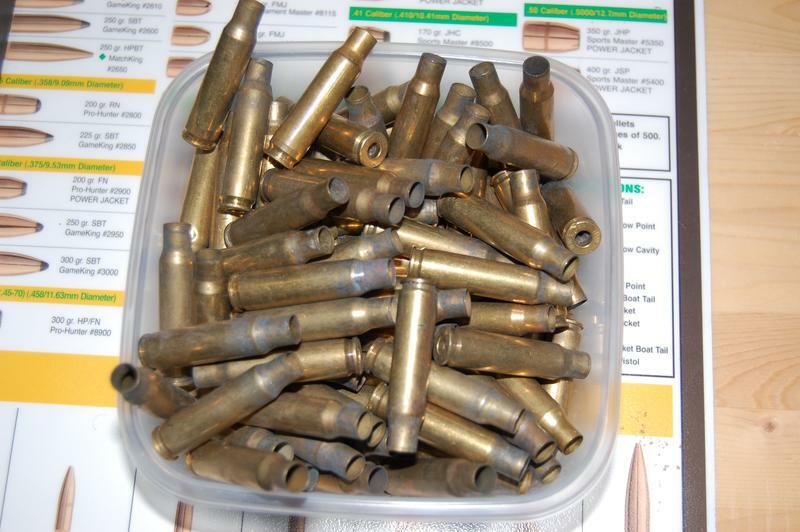 Having many, many hundreds on hand to be converted from fired brass condition into usable ammunition was just a stroke of luck as we would never just go out and discharge .308 Win by the scores just for reviewing a trimmer… OK, maybe we would… Alright… We did… And it was worth it! So lets start by explaining the components that you receive in the package when a Trim-It II is purchased… Plus the .308 Win Calibre Die. These are likely the cheapest component of the entire set. Now these two pages seem to be simple double sided photocopies that are folded into 1/8 the original size to fit into the box. One page contains the product warranty details and a fillable sheet for returning defective/broken products. The other sheet is the one that is most important to everyone that is reading… A parts list and instructions on how to assemble, tune, and utilize the Trim-It II. The instructions for this are only on a single unfolded side and also contain the instructions for refitting the original Trim-It with the new 3-way cutting head. Opposite the instructions is a parts list diagram of both the Trim-It and Trim-It II. So the cap serves two purposes, both of which are important for the functionality of the Trim-It II. First is the mount for the 3-Way Cutter that is secured along the cap’s centreline with a set screw. This forces the cap to rotate with the cutter when under power. The second purpose is to act as the threaded mount for the barrel part of the assembly. The barrel houses the Calibre Die, and because it is threaded into the cap, allows for fine distance adjustment for cutting brass to the proper overall length. The barrel has numerous openings which allow adjustment to the cutting head as well as a path through which trimmed shavings can be removed. The barrel has an external o-ring groove which holds the clear polycarbonate sleeve in place to prevent shavings from flying everywhere when in use. A set screw locks the barrel depth into place as well as locking the calibre die into its groove. The three way cutter is a miniature version of a milling machine’s adjustable boring bar. The cutter insert itself is a simple triangular insert whose corners have been cut to a V shape to trim both inner and outer chamfers and thereby also the length of any brass casing. TPF-Online did not remove the insert, but the V shape is on all three corners of the insert meaning that if you even wear down one of the cutting profiles, you can rotate and have a new cutting profile to be used. Twice… Since these are only trimming brass versus the insert’s carbide, it is likely to last for generations of shooters. 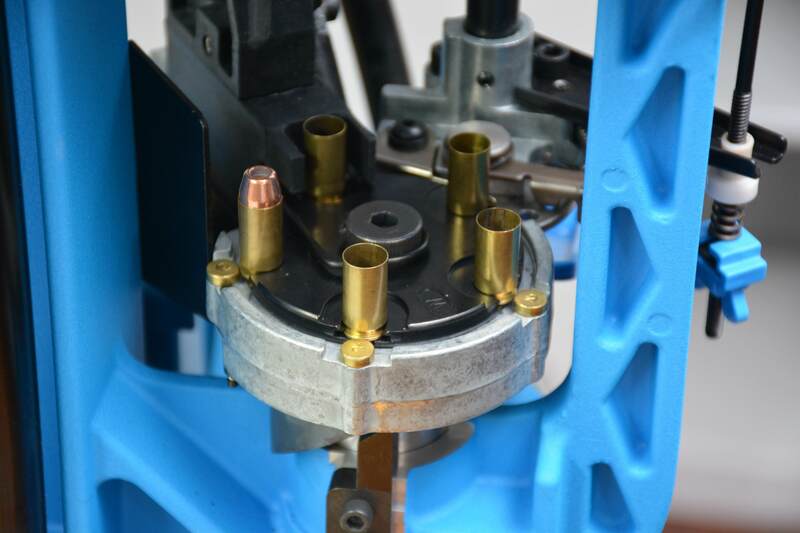 The mounting head of the cutter is adjustable itself, with the insert able to be shifted towards or away from the centerline of the cap/barrel. This allows for different diameter necks to be trimmed, but unless you have several of the cutters pre-set, re-adjusting the cutter for each new calibre introduced is required. These are sealed bearings that are modified by machining a custom inner ring to accurately position brass for trimming. These are precision tolerance bearings which are aligned by the barrel groove machined to exacting tolerances. 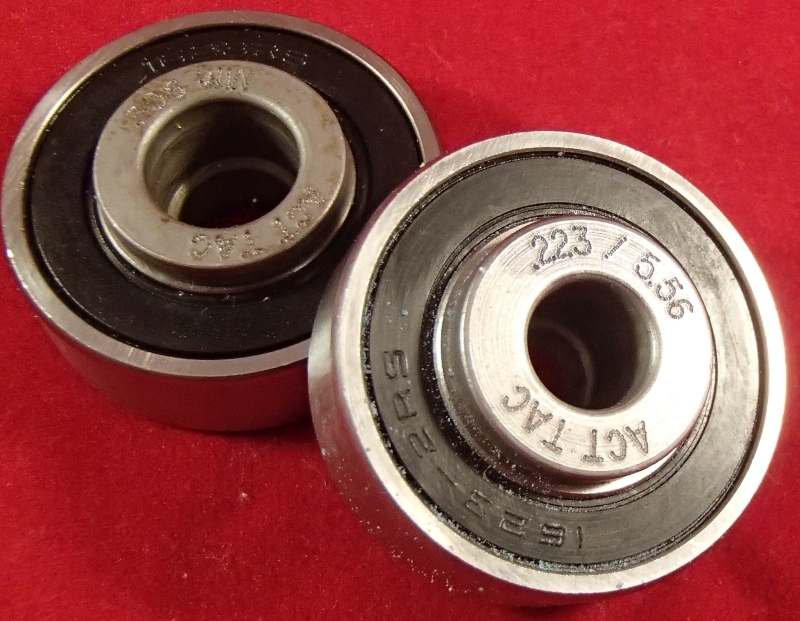 with the outer ring of the die secured with a set screw in the barrel, the inner ring is free to rotate independently of the cap/barrel/cutter assembly. 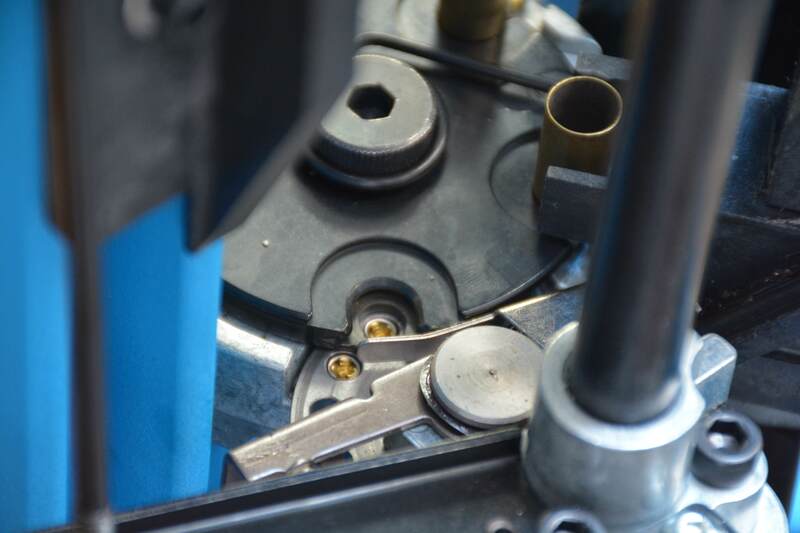 Install the 3-way cutter into the cap/barrel assembly so that it is as close as possible to the cap and secure with set screw against the flats in the shaft of the cutter. Tighten barrel into cap until it stops (“Zero”) back off until you alight the barrel index line with one on the cap. Unscrew barrel for one full revolution and lock in place with a set screw. Insert desired calibre die into place in barrel and lock it with set screw. 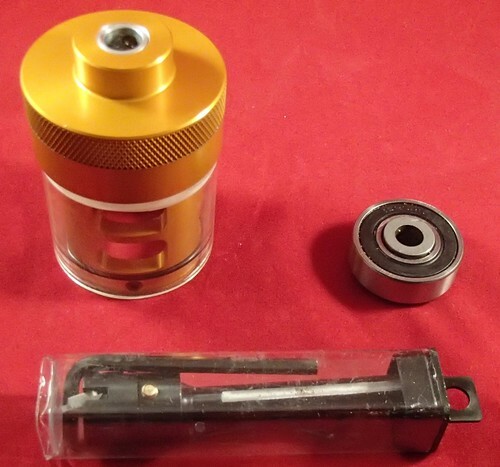 Insert desired brass piece into calibre die. Loosen cutter set screw and move cutter until it touches neck of brass. Re-tighten setscrew. Slightly loosen cutting head set screw and adjust the position of the carbide insert so that the neck edge will touch the base of the V shape cutout on the insert. Re-tighten cutting head set screw. 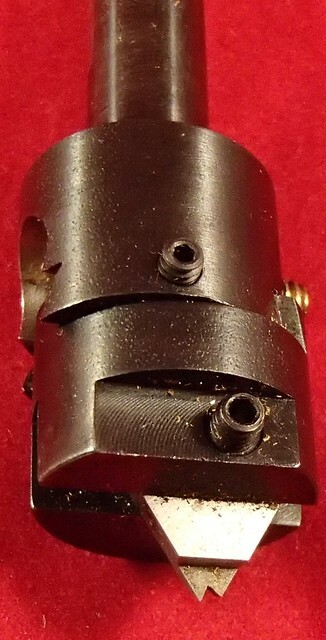 Loosen barrel set screw and adjust for height. Re-tighten. Each mark on the cap equals 0.002″ travel. Install into a drill, drill press, dedicated rotary tool, etc… Ensure the drill turns clockwise, otherwise cutters will not work properly. While drill is running, insert brass case into calibre die. If not trimmed to the right length shut down and adjust barrel as per Step 7. Go trim happy… When you don’t hear the inserted brass being trimmed, time to put in the next piece. It is a lot of work for setting up the Trim-It II, but once the tool is setup, the unit is spectacularly fast in doing it’s job. For those who only have a hand drill however, the entire setup will be hard on the hands. Table top drill press, or dedicated drive unit for the Trim-It that allows for two hands to manipulate and hold brass. Design change for the carbide insert adjustment. Use a fine thread screw for adjusting distance from centre line. The Trim-It II as reviewed is available from brick and mortar store locations such as Select Shooting Supplies in Cambridge, Ontario. Their listed prices are, at the time of this review, $189.95 CAD for the Trim-It II, and $29.95 CAD for each calibre die. Is the Trim-It II a worthy addition to one’s repertoire of reloading tools? Does it fall under the category of Tactical, Practical, or Fantastical devices for firearms owners? That is a simple question that only YOU, the reader can answer. TPF-Online wishes to thank Mr. Chris V. for his comments and additional input on this review. 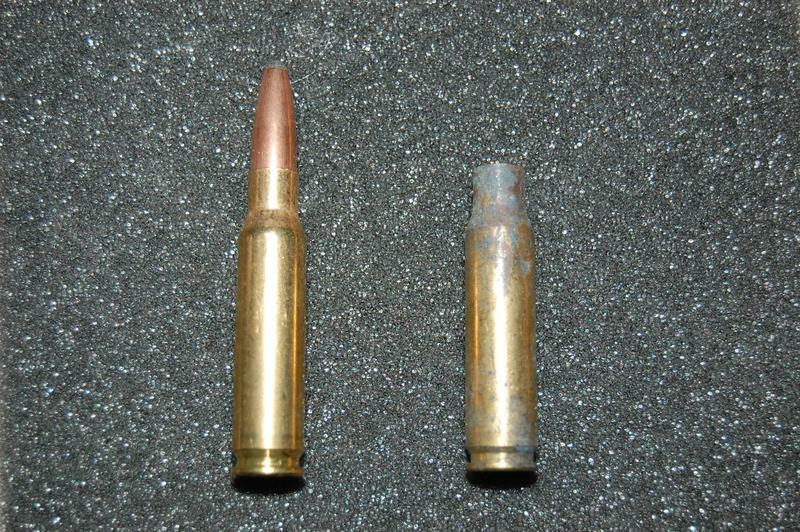 Between his efforts and those of TPF-Online, nearly 2000 pieces of .308 Win brass was trimmed in very little time. Wet tumbling. The good, the not so good, and the awesome? 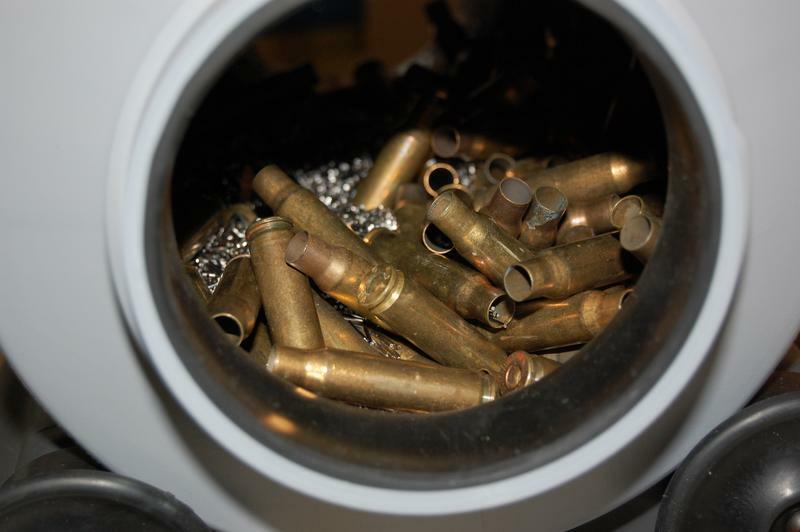 Getting brass clean enough for reloading is a dirt simple thing in principle. 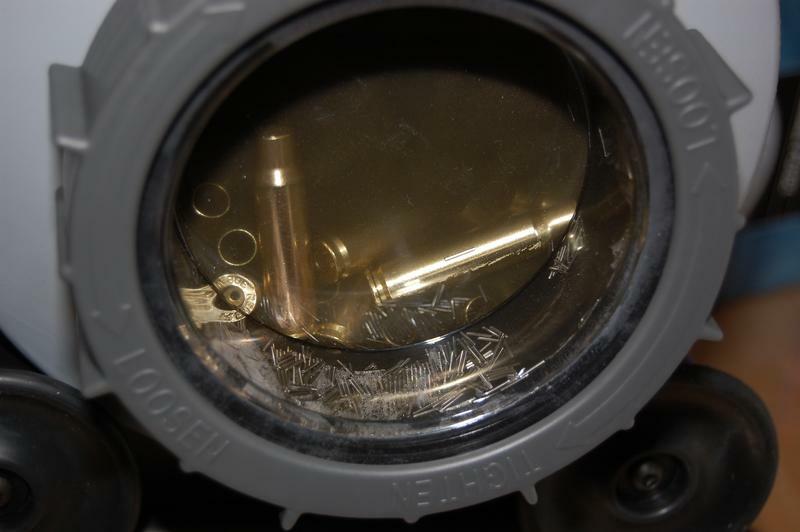 Wipe clean the outside of the case to ensure does not scratch or deform the brass due to dirt and debris while it feeds into a reloading die. That is all fine and dandy for someone who doesn’t really expend any volume of brass or regularly utilizes a Lee Loader for reloading, but what about the inside of the case? The primer residue and build-up in the pocket? What about tarnish and accumulated dirt and grime? 1911 owners who reload would loathe to leave behind scores of free .45 ACP range brass regardless of how dirty is was. The author fully embraces his Dutch heritage stereotype and if there is unclaimed, spent, centre-fire brass lying about at the local shooting range, it’s getting picked up. Firstly because it’s free brass, and secondly because the author likes to leave the range cleaner than when he arrived. What to do with the hundreds of free pieces of brass of 9mm Luger or .223 Remington that are strewn about the range on a nearly daily basis? Unfortunately you will likely need to clean them from dirt, grass, and exposure to the elements. Sorting is also an issue, but that will be addressed in a future installment. 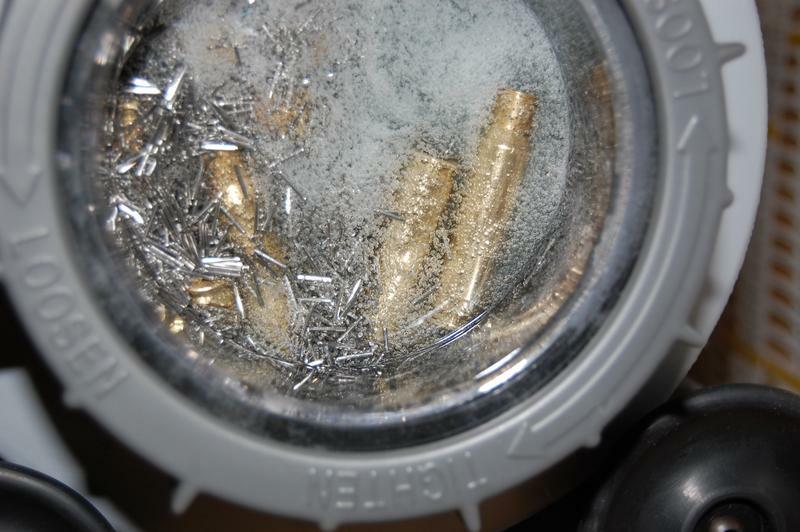 Back on the topic of case cleaning; TPF did a overview of a Hornady Ultrasonic Cleaner a while ago, and while that method does indeed clean out all the impurities, it does not necessarily mean the result will be gleaming, shiny brass cases. 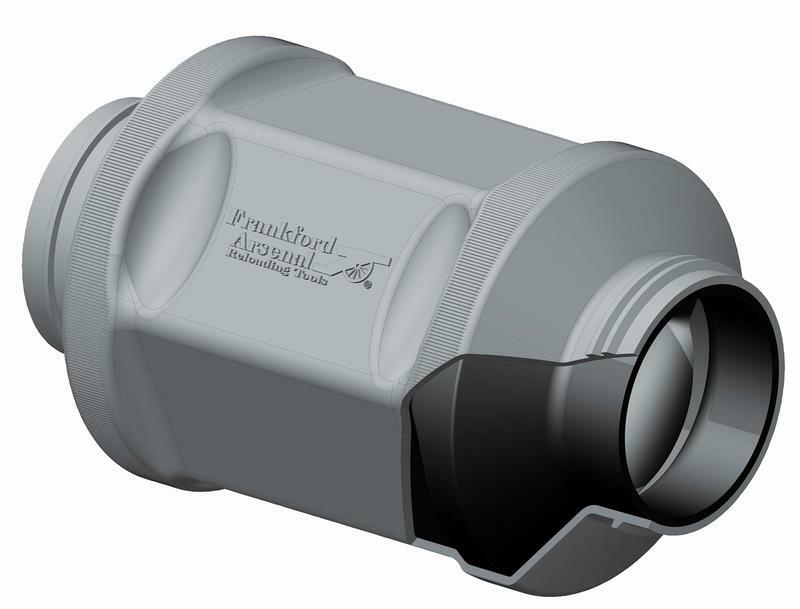 Enter today’s entry into Tactical, Practical and Fantastical, Frankford Arsenal’s Platinum Series Rotary Tumbler. This unit comes complete with the tumbling drum and the drive chassis as well as with inserts, stainless media and a sample of concentrated cleaning solution. But lets get to the details… The author has been collecting range brass for many years and as such has a fairly decent volume of spent cartridge cases sorted, and stored on reloading shelves. For this review, several hand fulls of .308 Winchester range brass was used for testing the effectiveness of this rotary tumbler. 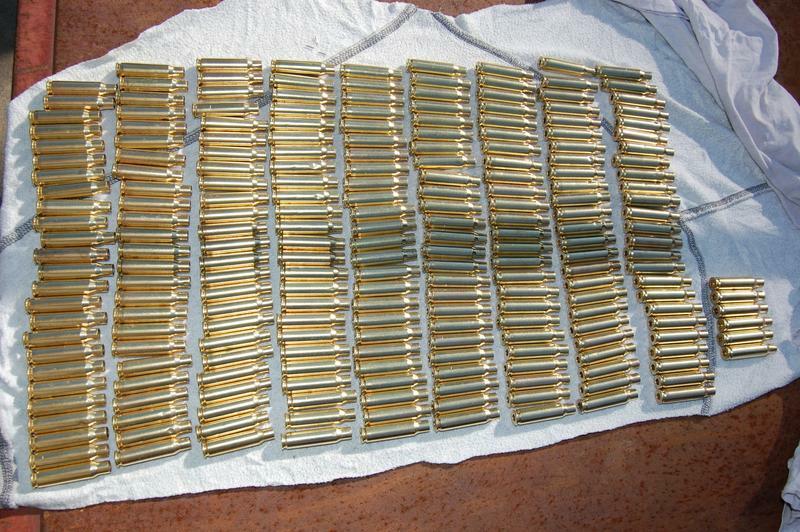 Only after the review did we count out 231 pcs of brass, a far cry from the 1000 pieces of .223 Remington that is claimed as working capacity. TPF looked over all the components of the unit and some items stood out for being remarked upon. The first item is the 1.85 gallon (7 litre) dual layer drum whose hard plastic outer shell can withstand the rollers and drive wheels and the mass of brass, pins, and liquids. Inside the drum is a softer rubber that is bonded to the inner surfaces of the drum. This is to quiet down the actual noise of an operating unit and also to ensure that the brass and pins tumble instead of just sliding along the inside of the drum. This is important as there are no protrusions internally to help agitate the brass and fluids while rotating. The end caps will normally be used with the clear window inserts which allow observers to become mesmerized by the continuous churning action. The initial setup was used with the handfuls of de-primed brass, the sample pack of cleaning solution, and filling the container with supplied pins and distilled water. Distilled water, for those readers with a questioning expression, is a water that has most impurities removed and is listed to generate the best results. With the clear inserts in place and water tight, the rotary tumbler was started on a two hour adventure. With a dry media vibratory tumbler the unit settles into a manageable background noise that can be ignored easily. With an ultrasonic cleaner the noise is a hum, plus any case to case vibrations, which can be high pitch, but in general is a low noise level. Compared to either of the others, this rotary tumbler is is not even in the same class. It is loud, as in automotive versus airplane in noise difference… Now perhaps that was from not having completely filled the drum to capacity of cases to be cleaned and allowing huge space for brass and cleaning pins to shift around a large amount contributed to the noise level, it will be revisited in a future utilization. Prior to distilled water and cleaning solution. The base drive unit of the tumbler is quite heavy and has a single set of driver rollers with the second set being a pair of idlng wheels. The controls are very simple for the power unit. It has a rotating dial which corresponds to the desired remaining time of operation. No on/off switch, just turn the dial from 0 to 3 hours. The rollers and geared drive units are listed as being rated for a maximum of a 13.4 kg (30 lbs) drum on top of the rollers. This published limit is there both to protect the drive gearing as well as the axles and plastic rotating wheels from excessive loads. For our review we set the unit into motion of a duration of two hours or the possible three. The machine chugged away on top of the author’s reloading bench for just over 2 hours and the noise of the churning brass and pins, as well as the drive unit itself could be heard through the floor and across the author’s home. 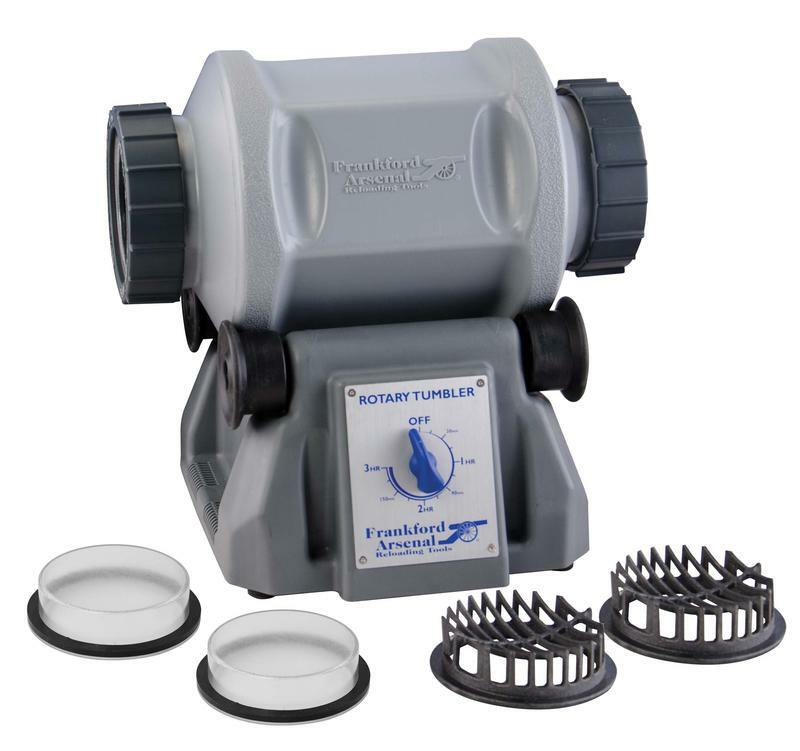 TPF recommends that if you utilize the this wet tumbler, that you perform the actual tumbling either outside, or in a garage as the operational sound level is quite high. Murky water cannot hide the gleam! Upon finish of the 2 hours, the water in the drum was murky and dark, yet the cases gleamed like beacons in the grunge. This is where we find the biggest and perhaps the only flaw of this tumbling kit. The strainer inserts are one of the things that seemed lackluster and a far cry from practical. The operator needs to install it onto one end of the barrel and then flip it over to remove the second cover in order to “wash out” the drum and cleaned brass of dirty cleaning liquid and stainless steel pin media. The only problem is that the media does not come out as easily as Franklin Arsenal would lead you to believe. This determination was made AFTER using the strainer in an attempt to “Wash out” the stainless steel media from the cases. Some pins did indeed come out and fell into a home made filtering bucket. However getting fed up with having a clean drum, and pins stuck in cases still, the whole load was dumped onto the filter and the drum rinsed clean and put away. At this point TPF used a rotary media separator that was partially filled with water which partially covered the load of cases in the rotating hopper. By spinning the hopper, the author proceeded to “separate” media from cases. This method worked spectacularly… What was left was a whole bunch of bright clean and very wet cases. Which is the second part that TPF is less than thrilled about, waiting for cases to dry… The author’s wife put her foot down when the oven was suggested as a means to remove the unwanted water. Luckily the time of year had a nice sunny warm forecast, and the cases were laid down to dry on a towel in the sun. And nearly 6 hours later when the author returned, the cases were dry and better than new in appearance. The largest deterrents for stainless steel wet tumbling is the media separation, and the drying of the cases. However the end result of the entire process is an awesome level of cleanliness and sparkling bright brass. 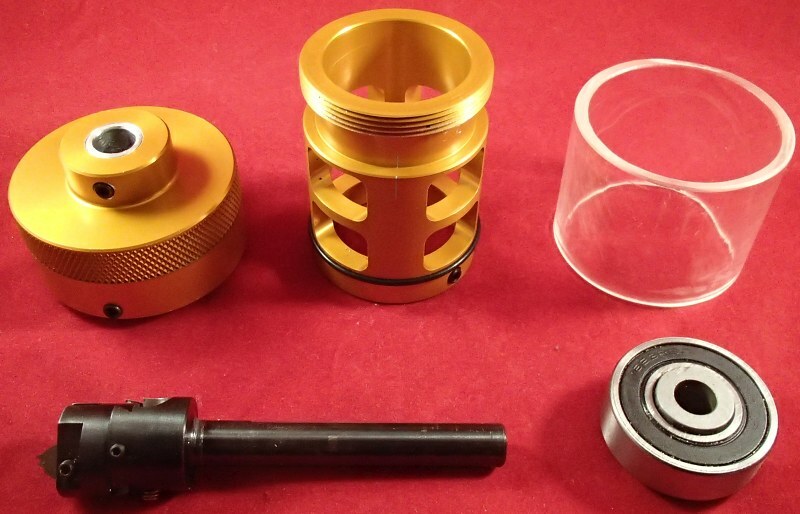 The resulting output from the Frankford Arsenal Platinum Series Rotary Tumbler (Model# 909544), is extremely clean and makes brass appear new once again. The reviewed unit has an MSRP of $239.00 USD, and can be found at brick and mortar stores across Canada such as Firearms Outlet Canada, located in Ajax, Ontario. Is stainless steel, wet tumbling worth the investment and worth the time? That is for you, the reader to decide upon and determine for yourself if it is Practical, Tactical, or Fantastical. When it comes to reloading there is only a single step that is as big and as important as getting the powder charge right.There are many ways to do this, but few that roll it all into one easy step. Hornady recognized there was a need for a more economical solution to weighing and dispensing powder, and introduced their own version of an automated powder dispenser a few years ago. I finally received the opportunity to sit down with one recently, and, the results were both interesting and impressive. Out of the box the Auto Charge includes the integrated scale/dispenser, powder silo, universal power adapter, two check weights (10 & 50 grams), flash pan, and a long thin brush for dusting out powder. Included with the manual is a comprehensive quick-start guide that allows for getting the Auto Charge up and running in a matter of minutes. If you do choose to jump right in with the quick-start guide, be sure to read both sides completely, as, the instructions for calibrating the scale are quite specific, and need to be followed in order to get under way quickly. The Auto Charge has a powder silo large enough to hold 1lb of powder. The guide recommends at a minimum that the silo be filled to the top of the base of the unit, in order to ensure there is enough powder in the hopper to dispense accurately. I had a small amount of Varget that just managed to fill the hopper to the top of the base as indicated, and after following the calibration instructions, quickly began to dispense 42.0 grain powder charges. Dispensing powder was as easy as entering the charge weight into the keypad, and pressing “enter” in order to set the machine to the desired charge. All that was necessary then was to press “dispense”, and the machine took care of the rest. 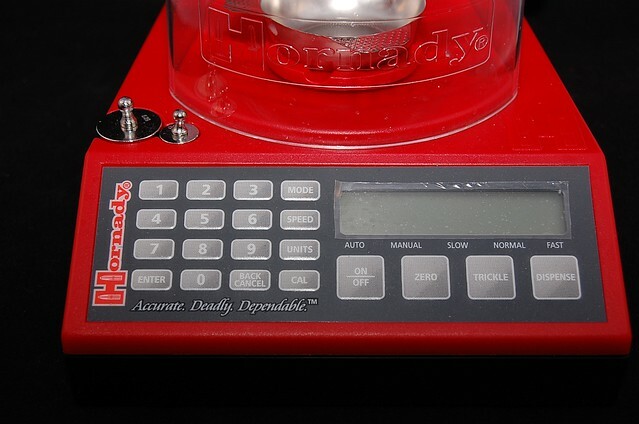 The Hornady Auto Charge is essentially a digital scale combined with a powder trickler. The powder tube is internally threaded, and angled downwards slightly, so that as it turns, powder is scooped up and moved along the length of the tube, subsequently falling into the flash pan below. As the dispensed powder reaches the desired charge weight, the Auto Charge slows down and enters into “trickle mode”, where it pulses a fraction of a rotation at a time in order to drop the desired charge weight one or two kernels at a time. There are three different speed settings for dispensing powder, slow, normal, and fast. Depending on the type and quantity of powder being dispensed, there is an ideal setting. I found that the bulkier powders were able to be dispensed on the fastest setting, whereas your finer, ball type powders tended to prefer the normal. Really fine powders, such as those used for shotgun or handgun really didn’t dispense well, or, required the machine to be set on the slowest setting, which meant a significant increase in time between charges. This really has to do with how the machine operates. During dispensing, there are in fact two speeds. An initial, high volume rate of dispensing, which varies based on the selected speed, and then a final trickling speed, which is more of a pulse. 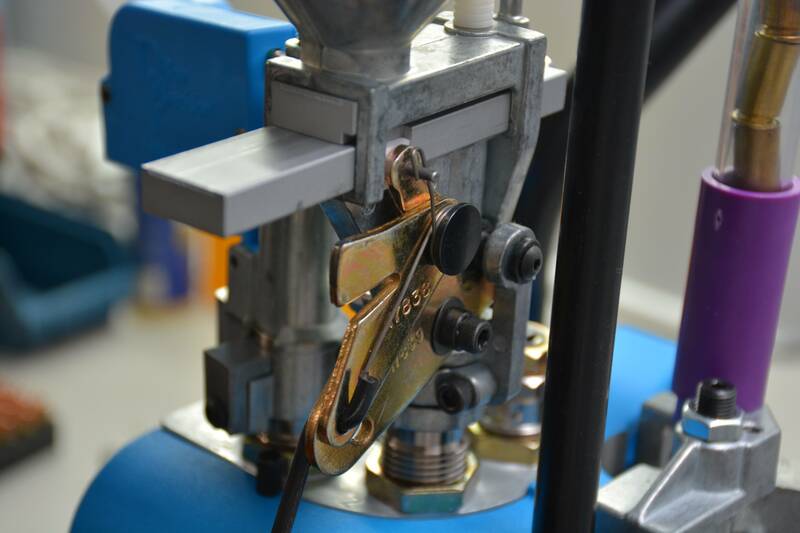 Depending on which speed you choose, the trickling mode will kick in sooner or later, so as to allow for as much powder as possible to be dropped into the pan before the final trickle to the desired charge weight. For testing purposes, I used both Varget, and Ramshot TAC. The Varget was able to be dispensed at the fastest rate, as, it is a bulkier extruded powder. It had a tendency to remain in the trickling tube and only drop one or two kernels at a time during the trickling mode, allowing for a very fast dispensing time, with minimal overcharge errors. The Ramshot TAC on the other hand is a much finer, ball type powder. It was far more likely to cascade out of the tube, resulting in the machine having to be run on the normal speed setting. I found on average that the dispensing time for 43 grains of both Varget and TAC to be 20-30 seconds. As I mentioned, the Auto Charge will result in an overcharge error if it’s run on too fast of a setting. I found that Varget only returned an overcharge error 1 in 10 times on the fastest setting, which meant having to re-dispense the charge. TAC resulted in an overcharge error almost every time on the fast setting, but had no issues when set to the normal speed setting. 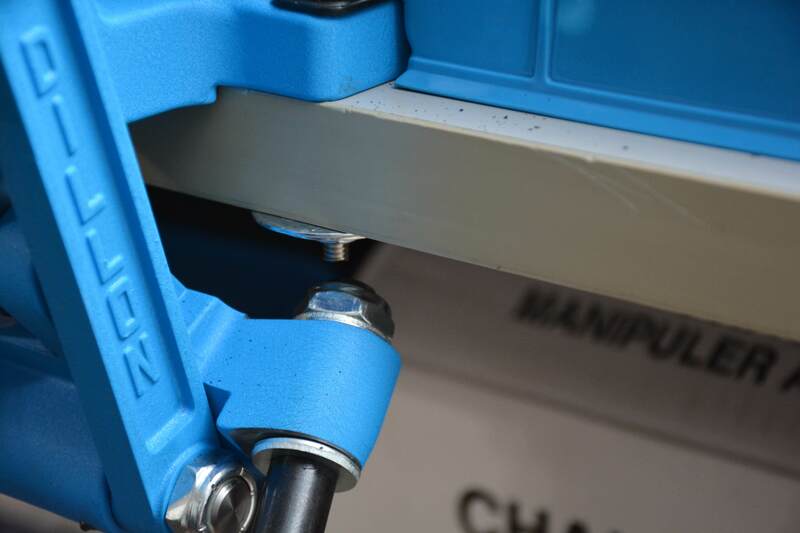 Once you’ve settled on a desired charge weight, and dispensing speed, you have the option of running the Auto Charge in either a manual, or automatic mode. Manual simply means that you have to press dispense each time, whereas, on the automatic mode, all you need to do is press dispense, and start dumping powder charges into your waiting cases. Each time you place the empty flash pan onto the scale, the Auto Charge will dispense the next charge as soon as the weight reaches zero. I found that with the machine set to its fastest setting, in combination with Varget, I was able to keep up an almost constant pace of charging cases, with only a short wait between dumping powder into the case and waiting for the next charge to be dispensed. I was pleasantly surprised by how well the Auto Charge worked. It’s a nice clean, simple unit, and was very easy to operate. I found that its ideal use is for load development, where you might have a number of different charge weights that you want to try. 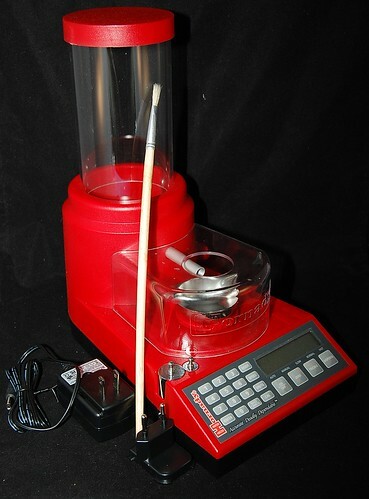 It is equally suited to regular reloading duties as well, however, a standard powder measure is still faster, and capable of dispensing most powders within the same accuracy range. What’s nice about the Auto Charge however is that you know every single time just how much your charge weights, and that there’s no potential for a mix-up, or double charge. Additionally, the Auto Charge can dispense close to a pound of powder, and not need topping up in order to maintain its accuracy. Having a scale built right in ensures you get the exact same, consistent charge weight. Hornady is a very much renowned reloading manufacturer based out of Grand Island, Nebraska, and Korth Group are a Canadian importer and distributor of many manufacturers and brands such as Hornady. Again, thanks to Andrew Craig for his submission on the Hornady Lock-N-Load Auto Charge powder dispenser. The product as reviewed has an MSRP of $317.21 USD. This and other Hornady products can be found in a variety of brick and mortar shops across Canada as well as online venues such as Grouse River (which has both!). TPF’s standard clause still applies to our readers to determine if this piece of equipment is Tactical, Practical, or Fantastical for themselves. 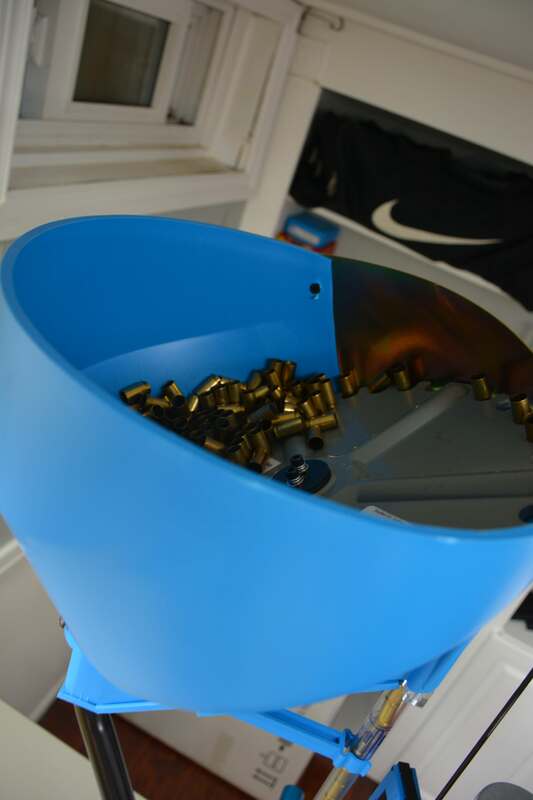 The solution to the second most tedious thing about progressive reloading… YES! “The second most tedious thing?” That was surely the question of most readers when looking at the title of this installment of TPF-Online. Yes, the author did mean to say the second most. The number one most tedious job from the majority of reloaders is trimming brass to length and there are a multitude of methods to do exactly that. 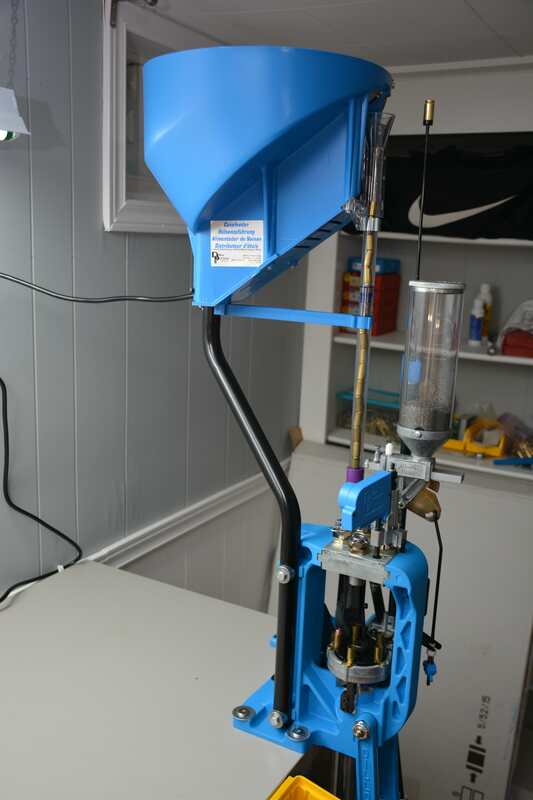 However this instalment is about the second most tedious thing for reloaders who utilize progressive presses from Dillon, Hornady, RCBS, etc… So what is the second most tedious thing in progressive reloading? Filling the priming system of the press. There are currently three common methods used in primer feed devices. Tube, Strip, and Box fed priming systems. 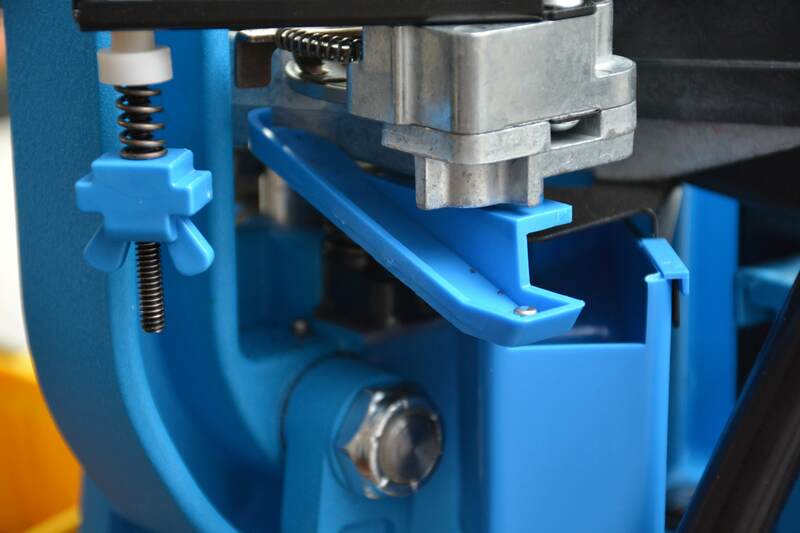 Lee progressive presses, like the Loadmaster, utilize the box feed systems for their progressive press designs and it is by far the fastest for reloading primers. RCBS progressives now routinely use a preloaded primer feeding strip system since it’s introduction over a decade ago. But for the rest, a primer fill tube is used for the reloading process to be have one hundred primers ready for reloading. This has, for many, been done via the old fashion method of using a primer flip tray and a primer collecting tube and manually forcing each individual primer into the fill tube. It can take several minutes for an experienced user to pick up a hundred primers, and so many people pre-load several of these fill tubes prior to reloading, which is hard on the hands. Don’t let the originating country fool you. Italy has made some tremendous discoveries and engineering masterpieces. Luckily however, the author occasionally peruses the internet for firearms related products and businesses at random, and it was not too long ago that TPF came across a Canadian IPSC shooter, Mr. Nik Papadhopulli, who decided to open up a small business to supply Canadian shooters with various items to help with reloading and equipment to help competitors with the shooting sports. One of these products offered is an accessory to help speed up primer tube filling. Now TPF knows about Dillon’s RF-100 primer filling station, which is a hands free filler. You put a box of one hundred primers in the top of the unit and press a button and couple minutes later you have a full tube. This option is quite costly with a price tag of nearly $400 including the option to be able to fill both large and small primer tubes. However, at roughly half the price of the RF-100, Red Tip Bullet offers an alternative to Canadians. The Pal-Filler, designed and manufactured in Italy by Palvik, is a hand held, battery operated, primer tube filler. Smaller, cheaper, and faster, this product already includes the ability to load both small and large primers. Now the Pal-Filler is not some complex, ergonomic and aesthetically beautiful product. It is in fact relatively plain and basic is shape and operation. Included is a double-usage primer tray, where one side is for small primers and the opposite side is for large primers. This tray is attached to the handle/grip and a primer tube is inserted in the appropriate opening. Operation of the Pal-Filler is a simple affair and assumes that the proper primer tube is already pre-inserted into the Pal Filler tool. A box of primers is dumped into the flipping tray, and shaken until all primers are anvil side up. 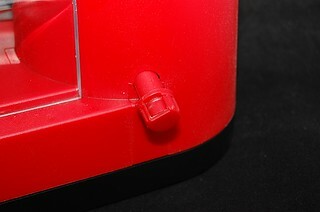 Once primers are all oriented properly, the user inserts the retaining lid. With the unit tipped slightly towards the tube filling hole, the user flips the switch. The vibration caused by a rotating offset mass vibrates the Pal-Filler and the primers all fall in sequence into the open tube top. Did TPF mention it was fast? From the primer box to a tube filled with one hundred (100) primers in roughly thirty (30) seconds. The Pal-Filler is literally a pistol grip with a primer tray attached to it. It is small, easy to handle and use and it is FAST! The concept for the Pal-Filler is very simple. Use proven, existing technology in a compact package. The small electric motor is wired in series with the simple on/off switch and the battery holder. The motor mounts an offset mass that creates the high frequency vibrations in the unit itself. It indeed is simple and one may think that should not equate into a high cost. Normally TPF would agree, except the Pal-Filler is completely manufactured on CNC machines. 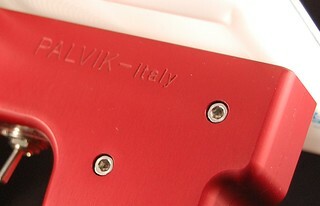 The aluminum grip halves are both machined from a billet of aluminum, inside and out. 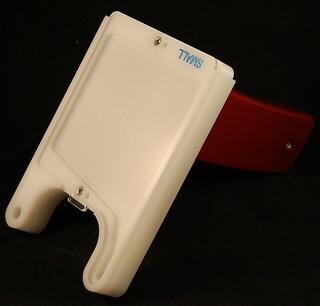 The tray is CNC machined from a block of high density plastic. The motor retaining bracket is machined aluminum as well. Even the battery holder is given a CNC machined base to be mounted on. The design features for ruggedness and longevity are apparent when looking at the Pal-Filler. Other than the typical battery holder, everything about the Pal-Filler is CNC machined and assembled with screws. No cheap plastic clips and glue here! Made from quality materials, with quality craftsmanship, this is a fine tool for the reloader who does not want to load primers into tubes manually and is especially suited to volume usage as done by many progressive reloaders. The Pal Filler as reviewed has an MSRP of $189.00 CDN and is available from Red Tip Bullets (http://www.redtipbullet.com). The question posed to our readers is if this piece of equipment is Tactical, Practical, or Fantastical. Addendum 2017… We have been informed that Red Tip Bullets has since closed its doors. Which is unfortunate.